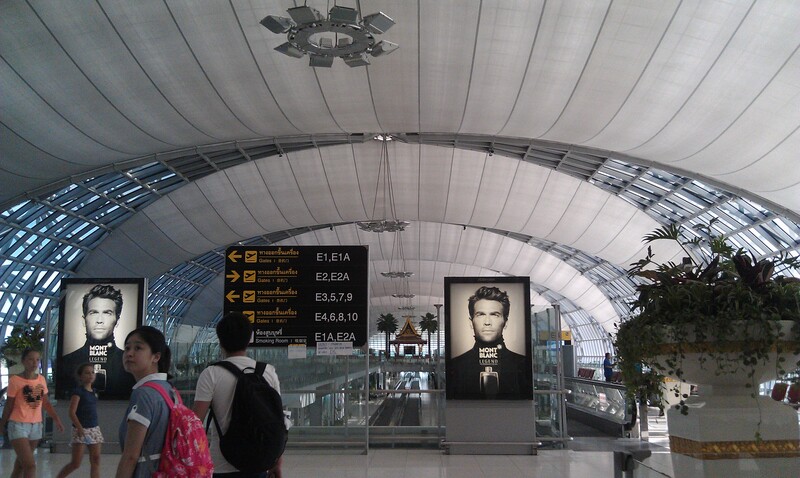 When you travel a lot, whether as a tourist or an expat returning home, airports become a familiar place. 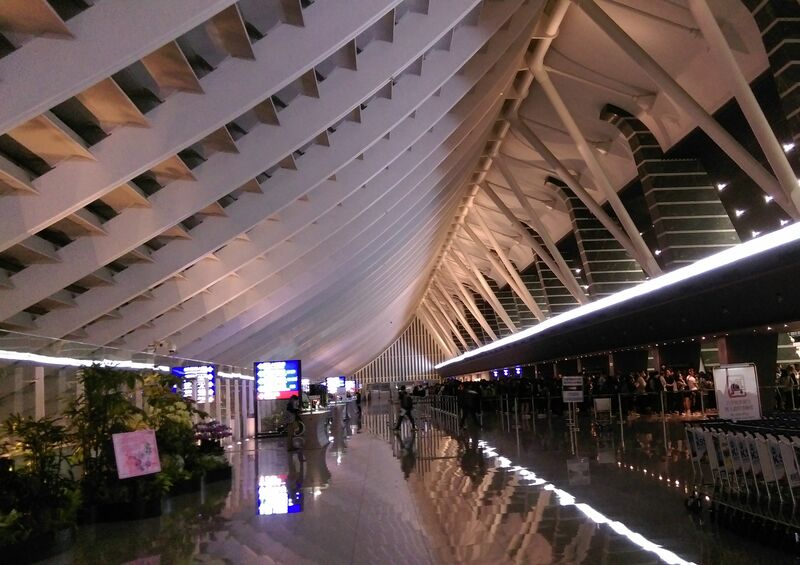 In Asia, there are a lot of modern, large, and sleek airports. It’s even better when they are attractive or have interesting features, like the ones below. 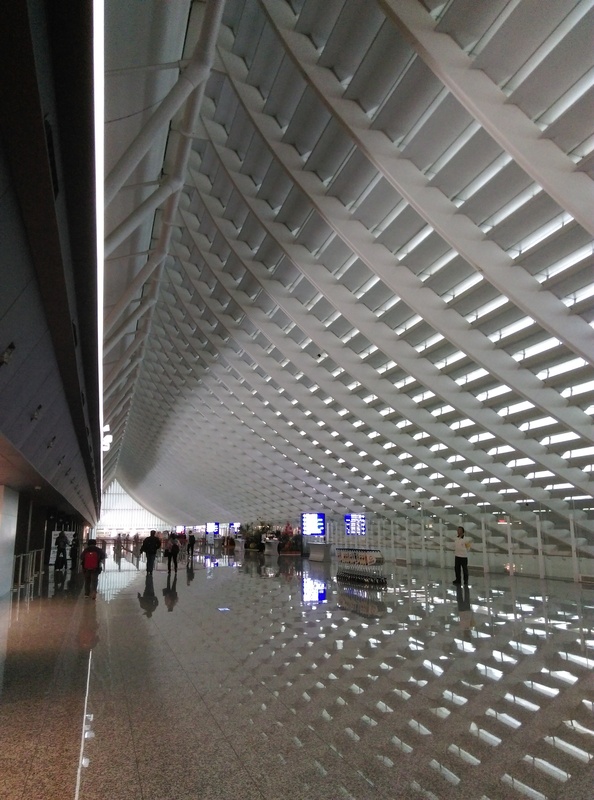 Taiwan’s Taoyuan Airport might be small but the slanted latticed roof of Terminal 1’s immigration hall is a very attractive and welcoming sight for visitors, especially with the reflection on the floor. Every time I see this roof, I never fail to be impressed. 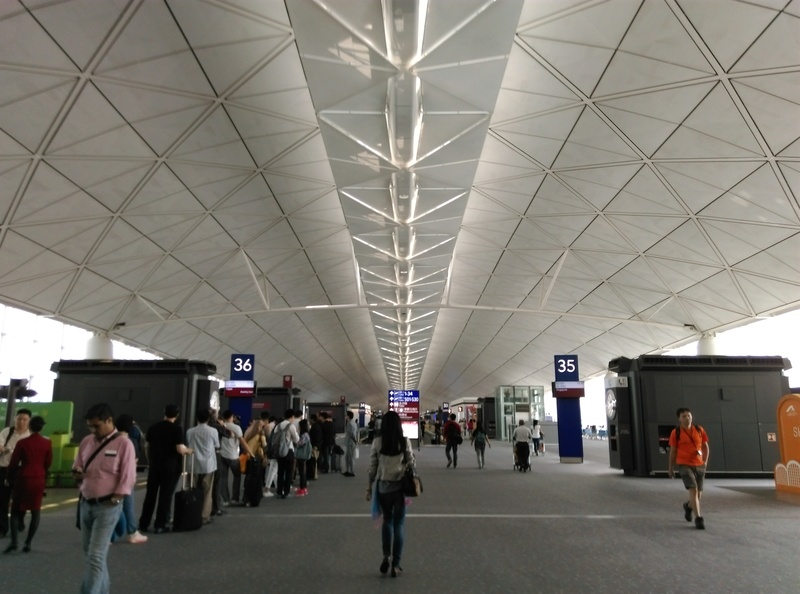 I’ve passed through Hong Kong’s airport, one of the largest in Asia, so many times but it’s still one of the best I’ve been too. 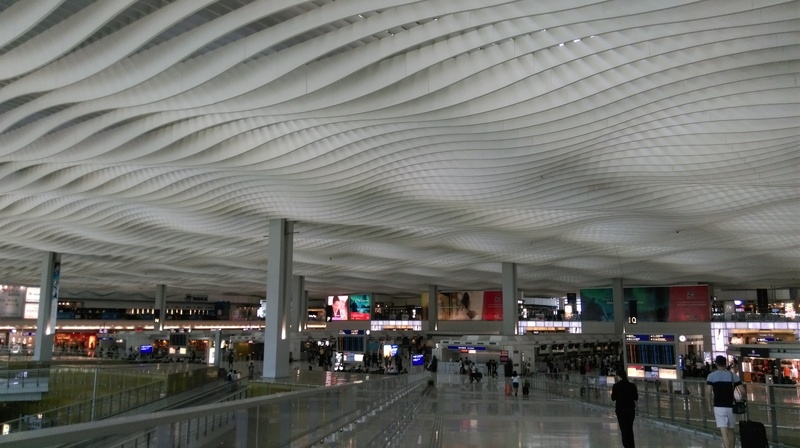 The Terminal One departure gates as well as the newer and smaller Terminal Two check-in hall are attractive, especially the wavy ceiling of the latter. 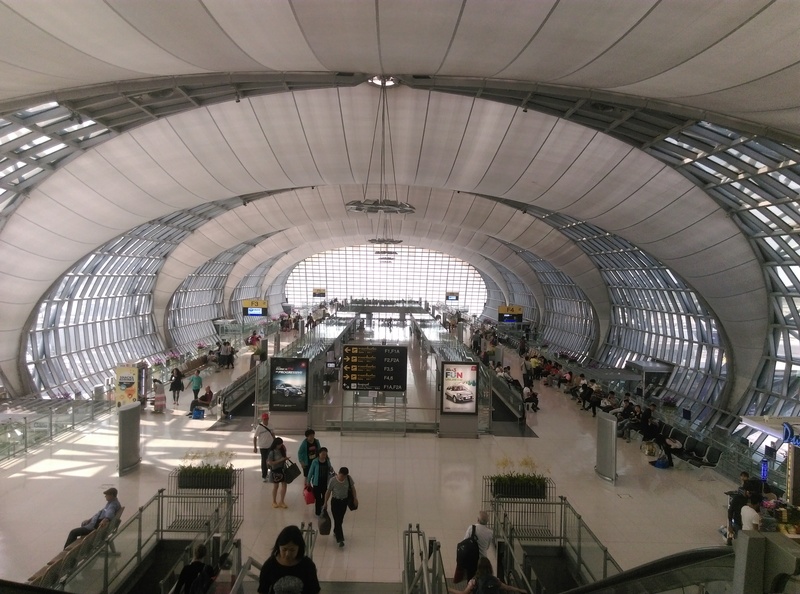 Bangkok’s Suvarnabhumi airport is another large and attractive one in the region. 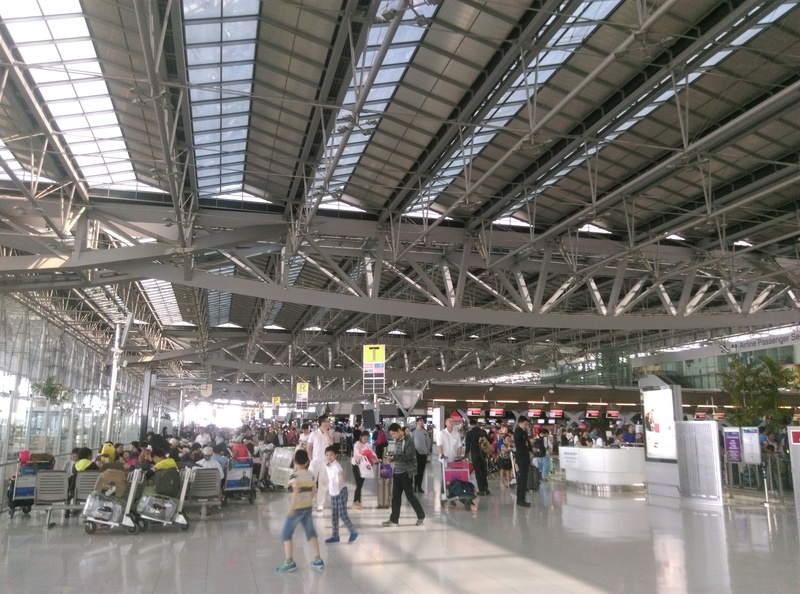 But despite the throwback metal shed-like appearance of the check-in hall, the departure gate area is another story. 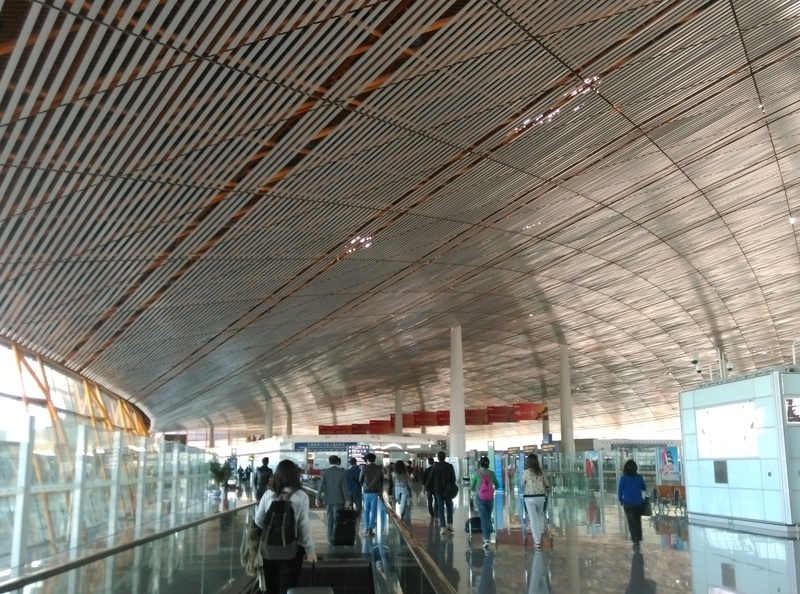 Beijing’s airport is one of the largest in the world but even then, it isn’t as modern as Hong Kong’s airport, as sleek as Bangkok’s, or welcoming as Taipei’s. 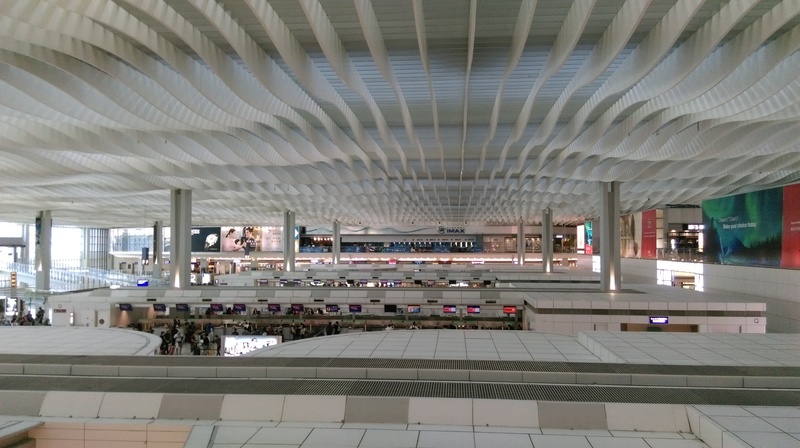 As with a lot of things in China, size and grandeur take priority over actual convenience and warmth. It does have a cool red ceiling with a layer of stripes below it. 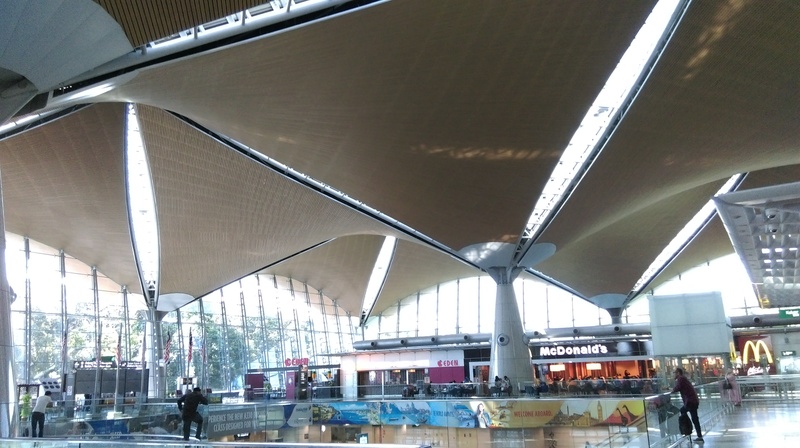 Kuala Lumpur’s airport features a unique brown, lumpy ceiling that is probably based on indigenous hut design. 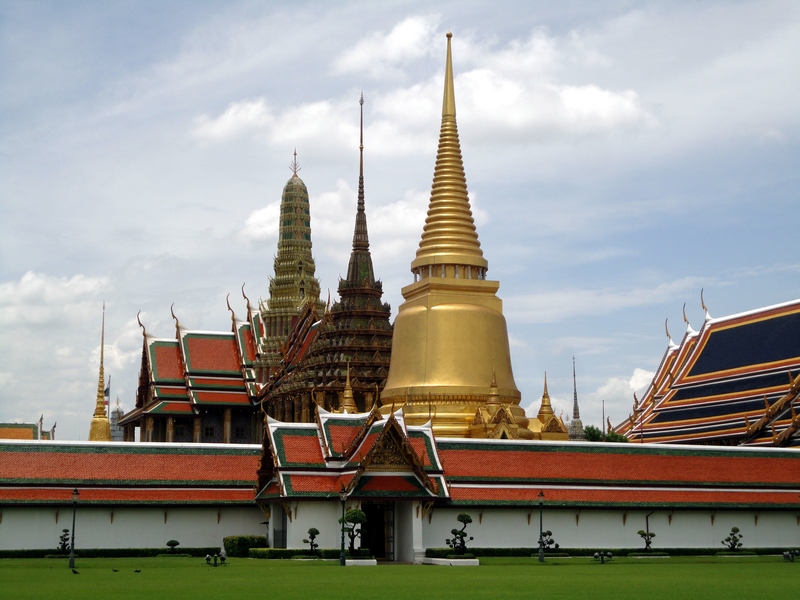 One of the things Thailand is most famous for is Muay Thai or Thai boxing or kickboxing. Known as the art of eight limbs, Muay Thai fighters use their elbows and knees to strike in addition to fists and feet so it is a violent and exciting martial art. I became fascinated by the sport after seeing it in movies like Kickboxer and the Quest, both with Jean Claude Van Damme, as well as online videos of Muay Thai fights. When I first went to Bangkok in 2013, I was finally able to watch it live at the fabled old Lumpinee Stadium. 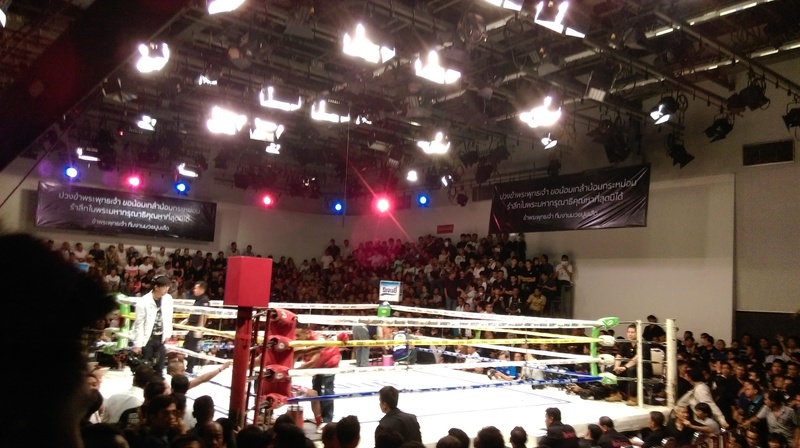 When I went to Bangkok earlier this year, I decided to go watch Muay Thai live again, but at a different venue – the Channel 7 studio. 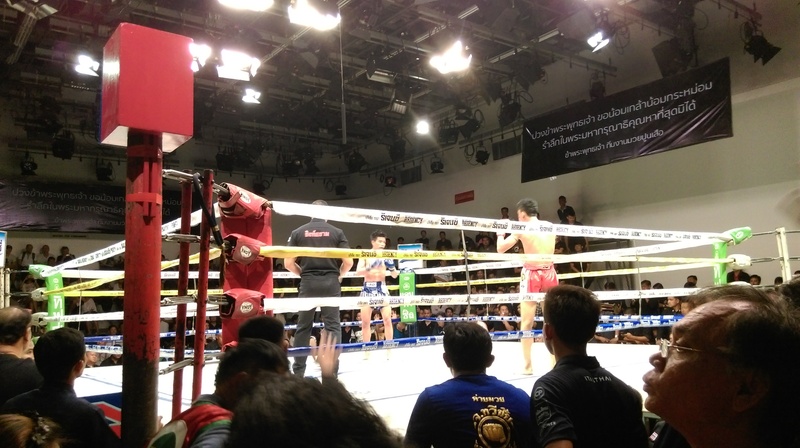 Less high-profile than the Lumpinee fights, the Channel 7 fights take place on Sunday afternoons, is free to attend, and is broadcast live on TV. The venue is a large indoor space that seats around 500 (I may be off by a quite a bit) and is kind of near Chatuchak Market. It is a very raucous environment, especially if you happen to be in the stands where locals are shouting out or offering bets during each fights. The fights were mostly eventful, though I remember one that went the distance but I was puzzled by who the win was awarded to. There were a couple of TKOs but no outright knockouts. During a fight, the most exciting moment is not kicks or punches but when the fightrs clinch and exchange knees. 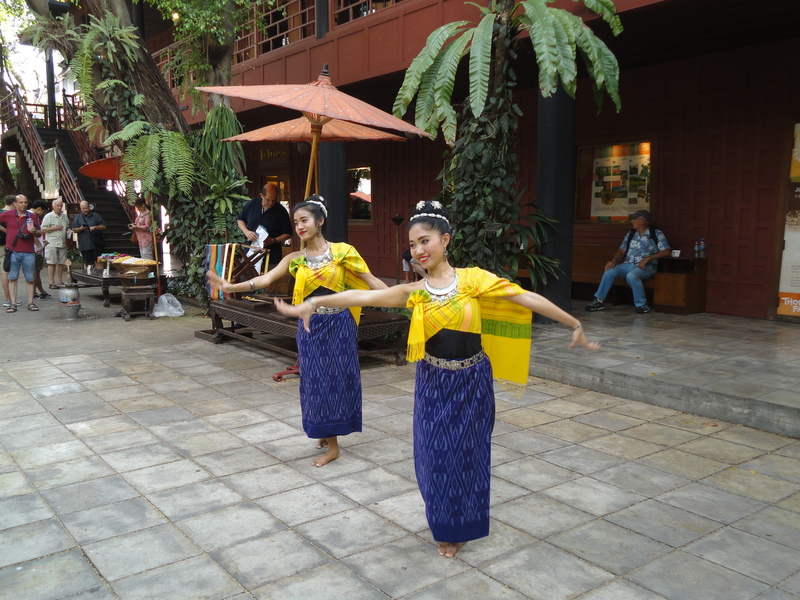 The venue is situated inside a compound in a residential neighbourhood is across the main road from the Chatuchak Market and subway station, about a 15 minutes’ walk. Because I hadn’t been to the venue before, I actually arrived about 45 minutes early. I took a peek inside the venue, saw a lot of empty seats, so I took a walk around the block and came back. This time, the stands were packed so I went to the side where there were some empty seats. It turned out this was where a lot of bookies were operating, and I jostled with an older man who demanded I give up my seat. I didn’t and he eventually squeezed in next to me, and we spent the whole event side by side. This old guy was one of the main bookies who kept shouting out bets and taking in money throughout the fight. 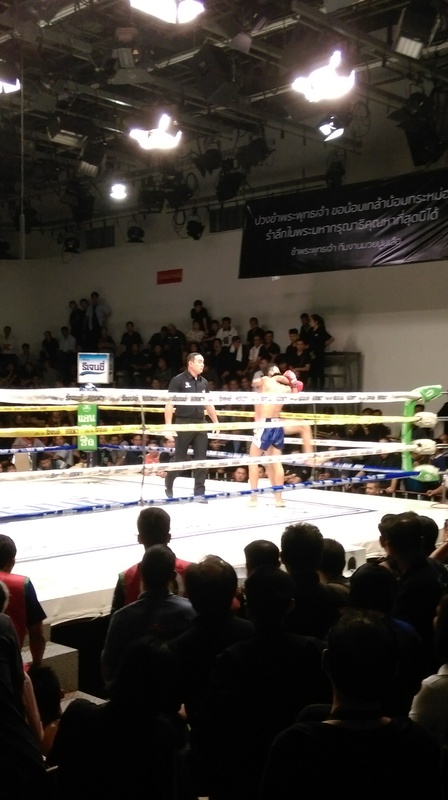 As I don’t know Thai, I couldn’t understand exactly what was going on but I know that the betting would be especially frenetic when people though a knockout would happen. 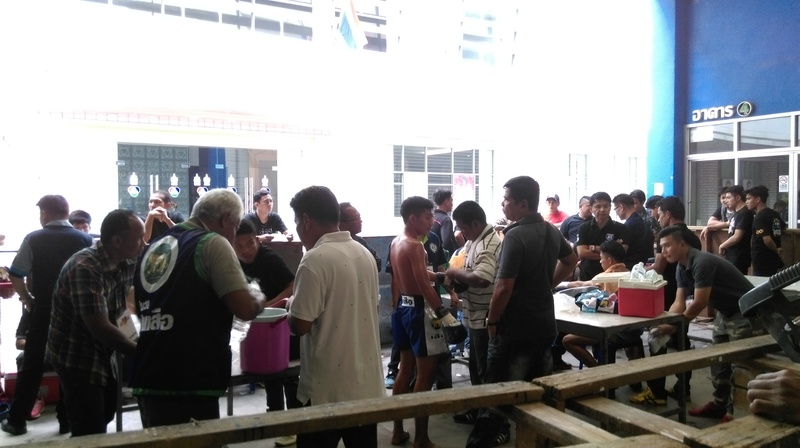 The more prestigious fights take place at the new Lumpinee Stadium and Rajadamnern Stadium several evenings a week but cost quite a lot for foreigners (around $40 for the standing area, the seats cost much more). But the cards at these stadiums feature more fights and sometimes, there are title fights. For some reason, these stadiums are located in northern Bangkok and are not close to the subway so you need to take a taxi to get to it. It’s not that convenient to go to (if you are a non-local and don’t know your way around) since fights end at after 9.30 pm. 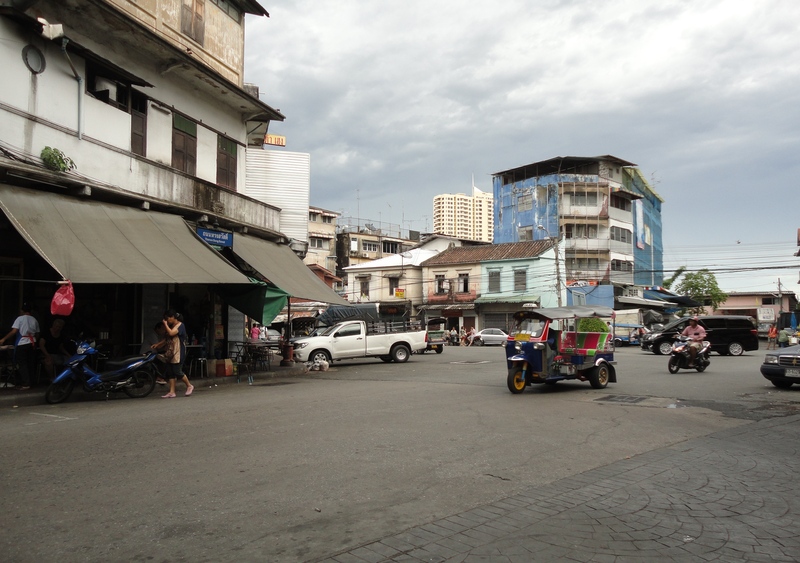 The old Lumpinee Stadium was very close to the Lumpinee subway station. Prefight preparation with the fighters outside the entrance. The facilities are rather sparse here. 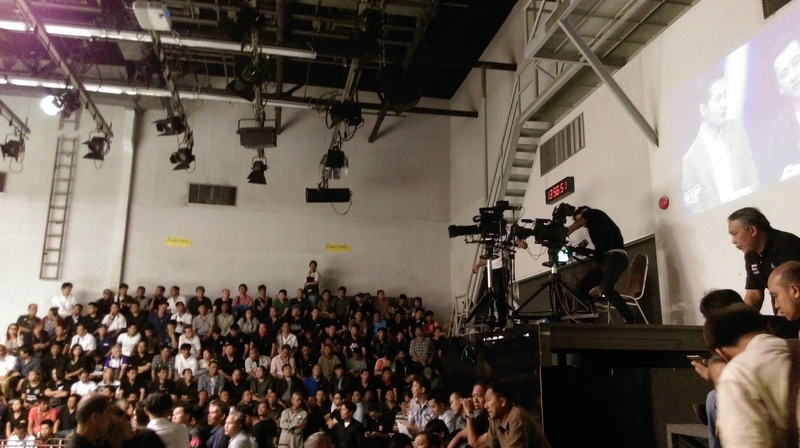 The TV cameras at the back as well as the live broadcast on the screen to the right. Bangkok is a city I didn’t like much the first time I went there several years ago. But after going there a couple of times again in the last two years, for brief stays while transiting to other places, I confess I’ve had a change of heart. 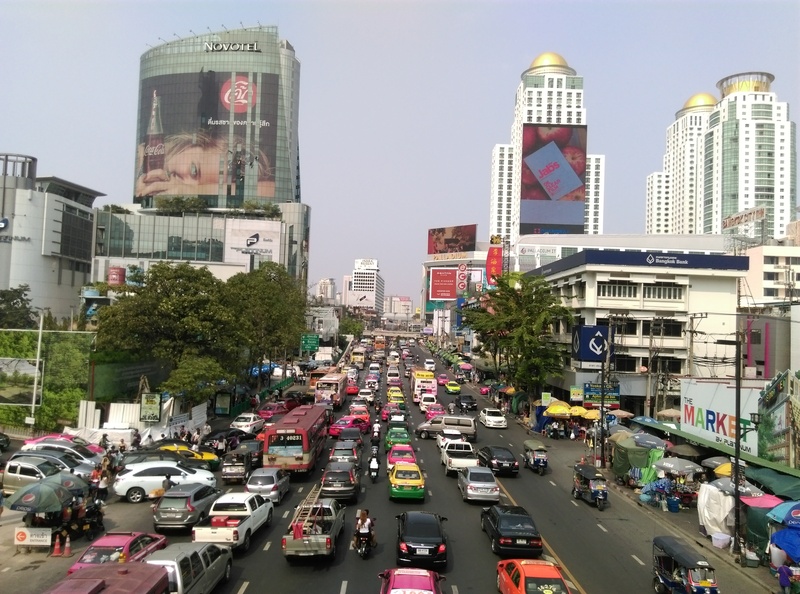 Not only does Bangkok not seem so noisy, ugly and stifling, I think I might even like it a bit. 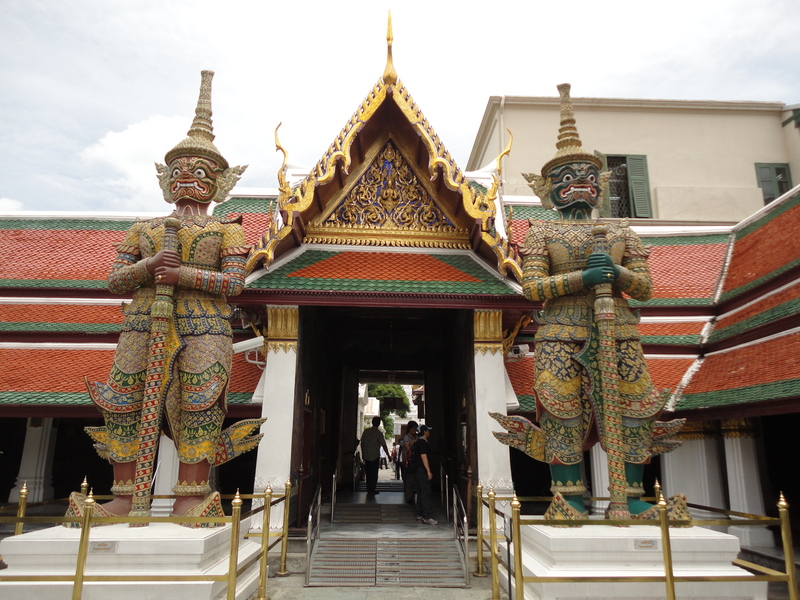 Once you go beyond the famous attractions like the Royal Palace, Wat Pho, Wat Arun, and the mega-malls, there are a number of interesting places to check out. 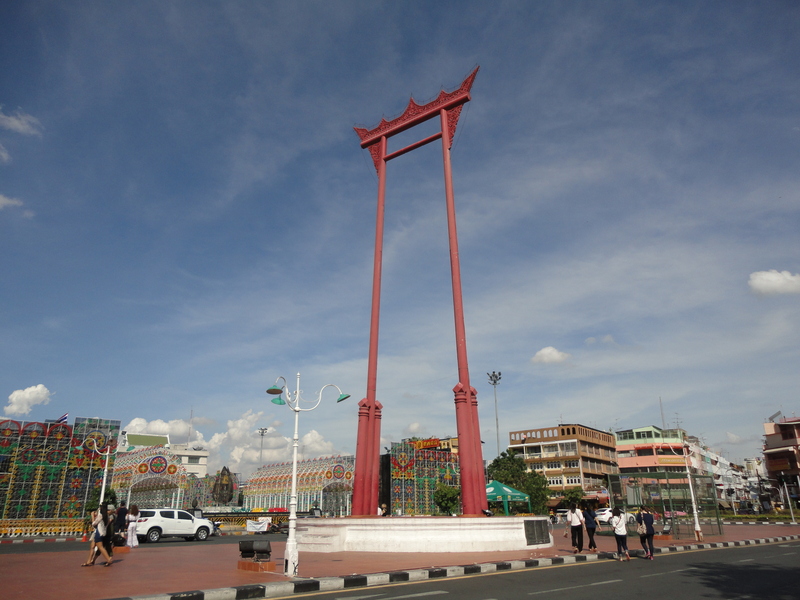 There is the Big Swing, a giant swing over 15 meters high from which people used to swing on it to try to retrieve something from the post during religious ceremonies (it sounds dangerous and indeed it was banned in 1935 due to a number of deaths), and the elaborate Wat Suthat temple next to it. There are the many English-language bookstores ranging from Asia Books, a local bookstore chain, to Dasa, a multi-level second-hand bookstore, to Kikokuniya, a large Japanese regional bookstore chain. Compare this with Hong Kong where Dymocks and Page One have both shut down in recent years, leaving only local chain Bookazine for English-language books. 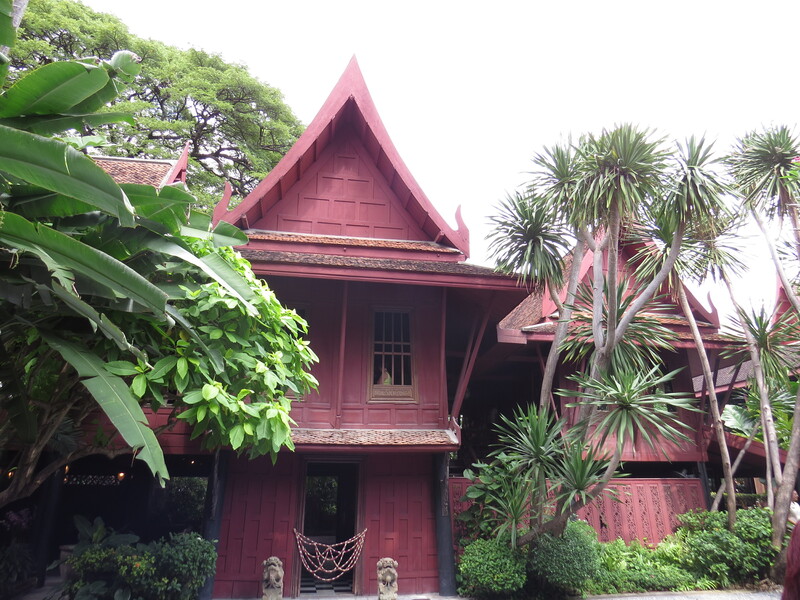 Then, there is Jim Thompson House, the former residence of silk magnate Jim Thompson. 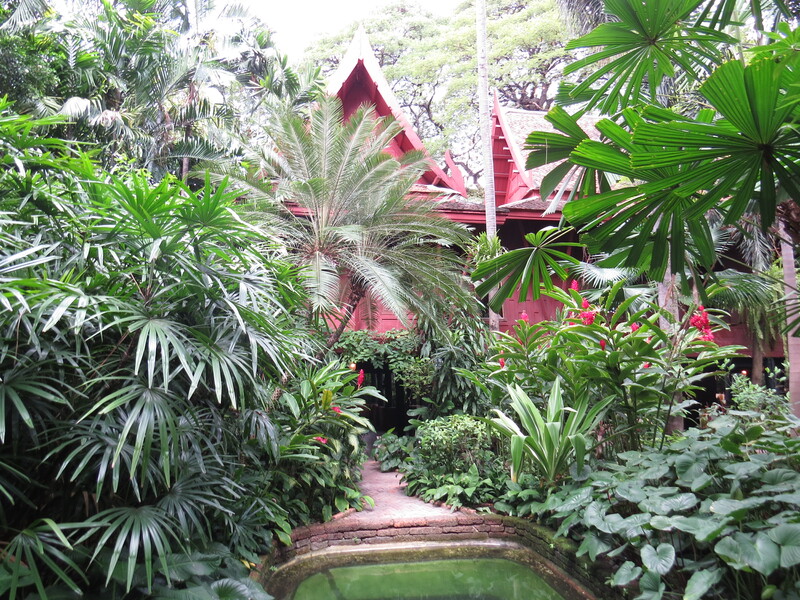 The small, but spacious and pleasant compound consists of several red houses, built from teak in the traditional style and brought over from other parts of Thailand, and a garden. The houses are attractive and comfortable, though you can only enter them as part of a tour (which is included as part of the entrance fee). 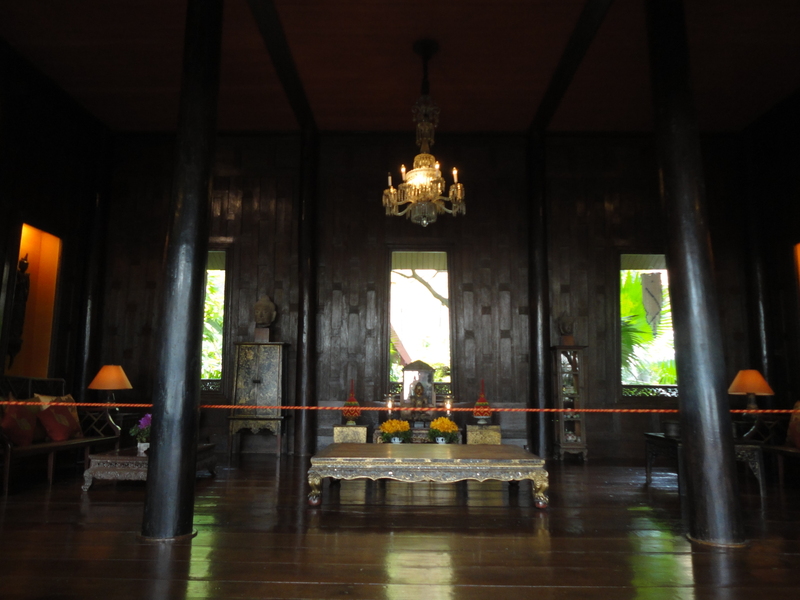 Of course, the houses may be traditional but they are probably much bigger and fancier than the ones regular Thais lived in. 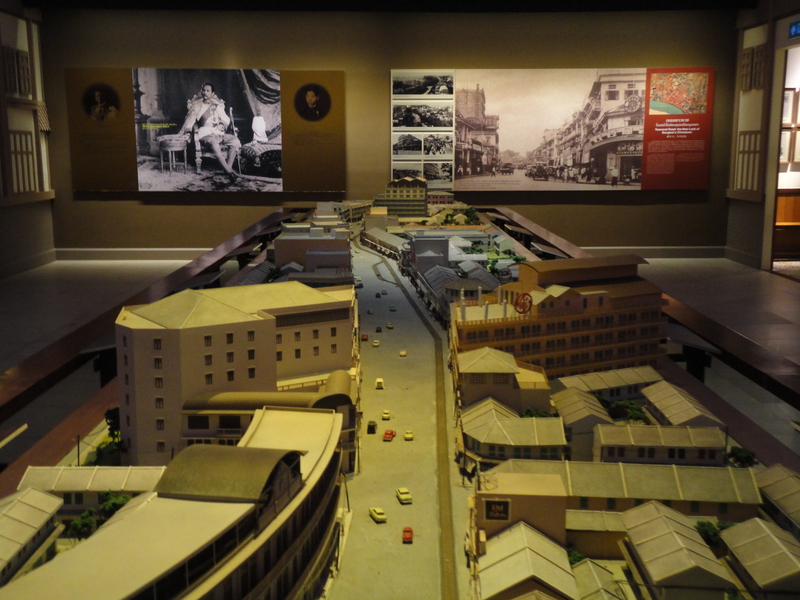 Thompson was an American businessman and intelligence operative (he served in the OSS, the forerunner of the CIA, during World War II) who settled in Bangkok and built up a silk export business, and disappeared in Malaysia’s Cameron Highlands. His disappearance remains a mystery even now though his silk brand is still thriving. There are more, but that will be for another post. Another form of public transport in Bangkok, which I took to get to the Giant Swing. 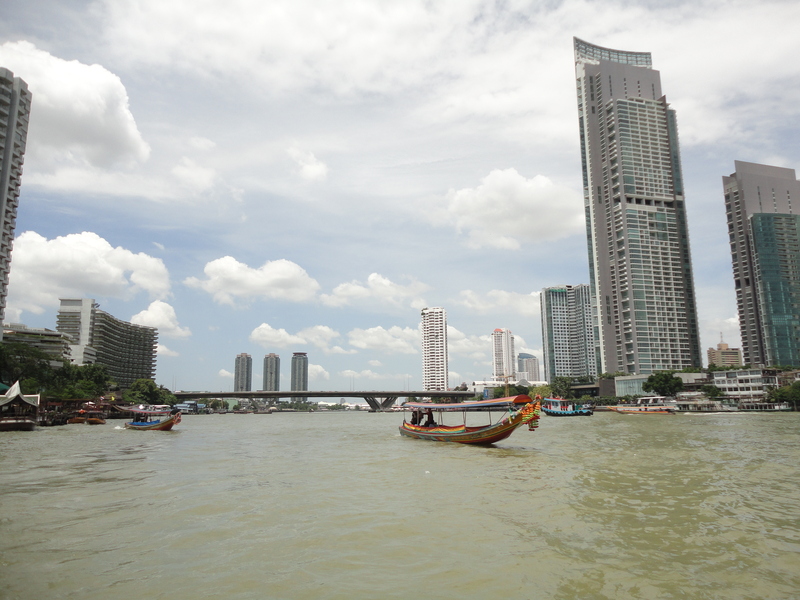 These boat taxis run on the narrow canals (klangs) and are different from the Chao Phraya river taxis and not as pleasant. 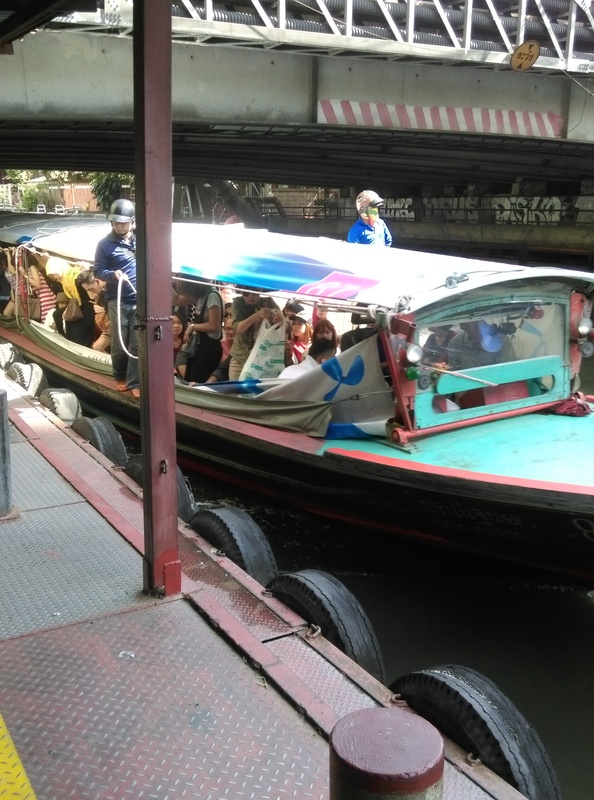 The canal is not very hygienic and the boats are completely enfolded in tarpaulin, which are let down when passengers get on and off, as you can see in this photo. Try it for the experience, but I wouldn’t recommend taking it more than once. 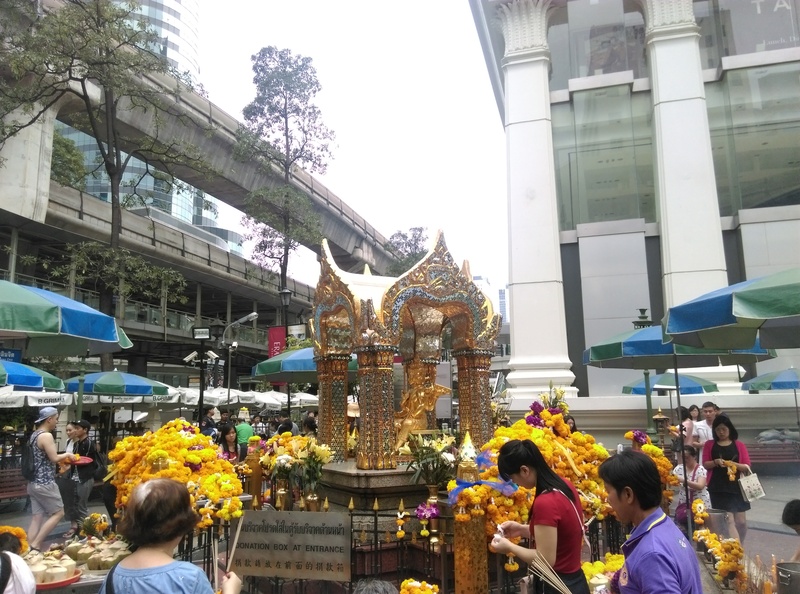 Erawan Shrine, a Hindu shrine located at the corner of a busy intersection surrounded by offices and shopping centers. This was the site of a bombing in August 2015 that killed 20 people and injured over 100. I took this photo in 2016. 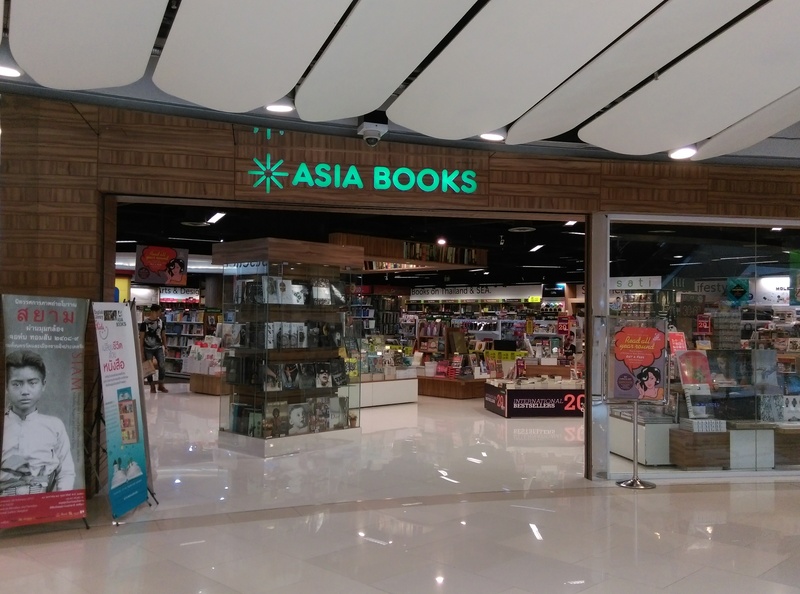 Asia Books is a local English-language bookstore chain that has a wide selection. This outlet is in Siam Paragon. 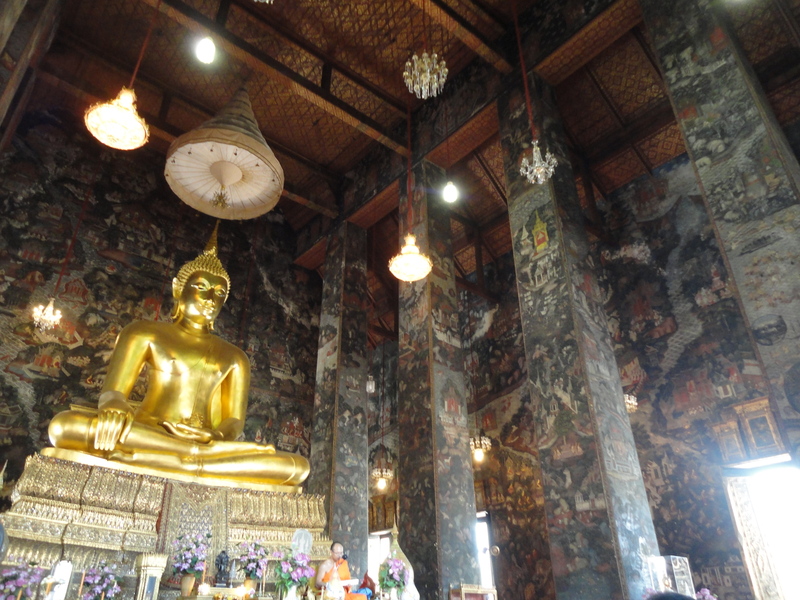 It has a massive golden Buddha inside and walls and columns covered from floor to ceiling in intriguing black mosaics. 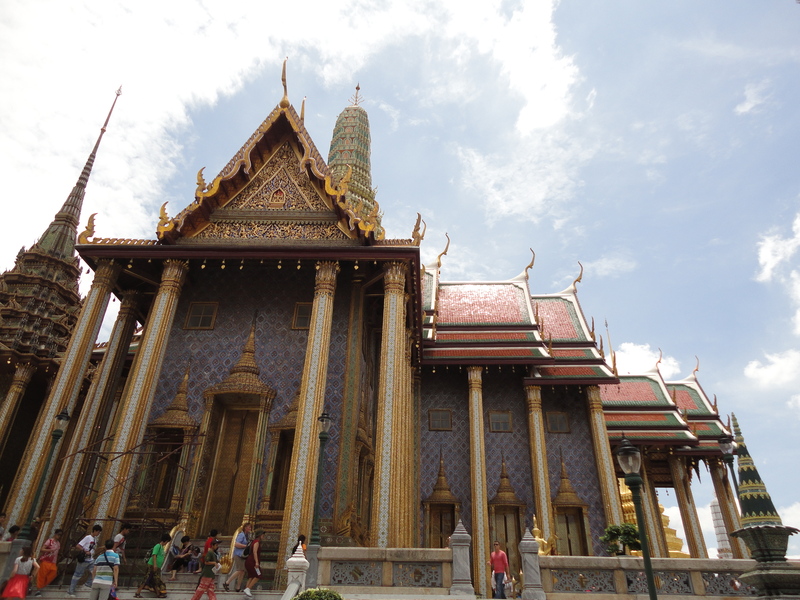 The final full day in Bangkok was reserved for the most famous attraction – the Grand Palace. A large complex full of impressive stately buildings built with a blend of traditional and European styles, it does live up to its name. 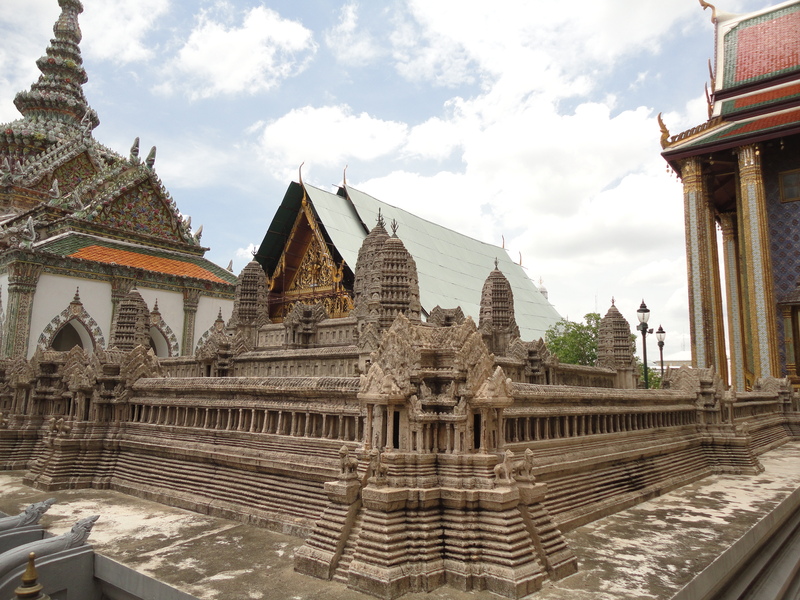 The complex features several temples, pavilions, buildings and a museum. However, when you look at the complex from a distance on the north side, you can’t miss a massive golden dome looming over the walls. 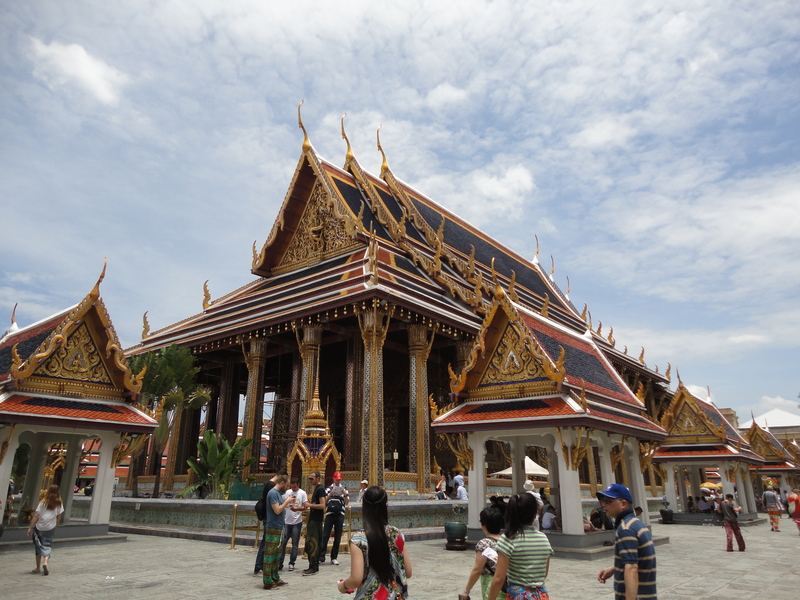 This is the Temple of the Emerald Buddha or Wat Phra Kaew. 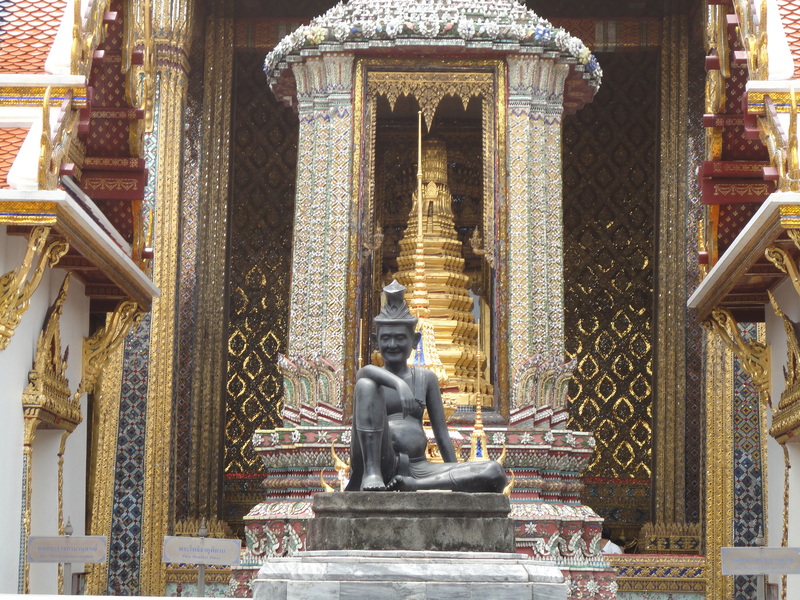 The Emerald Buddha is a seated Buddha indeed made from green jasper and cloaked in gold. 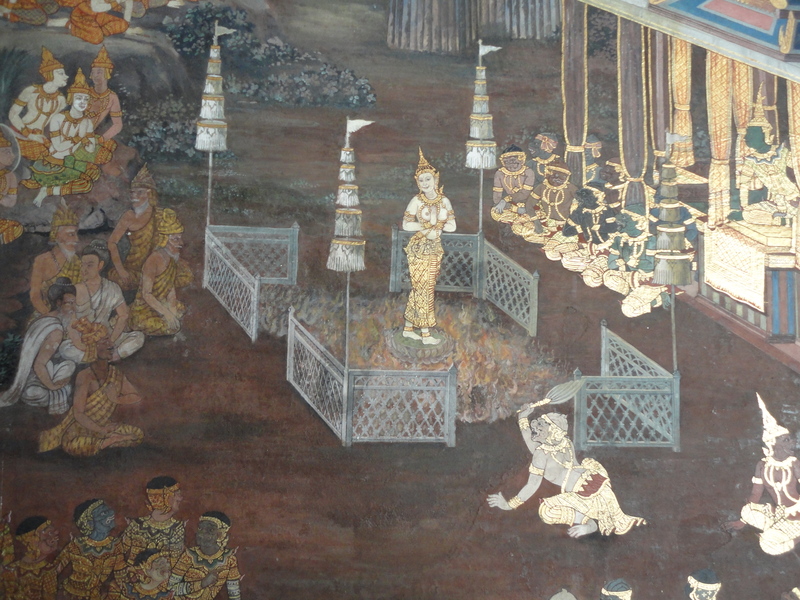 It was actually taken from the Cambodians when Thailand captured Angkor Wat in 1432. However it was made long before that, supposedly having been created in India in 43 BC! 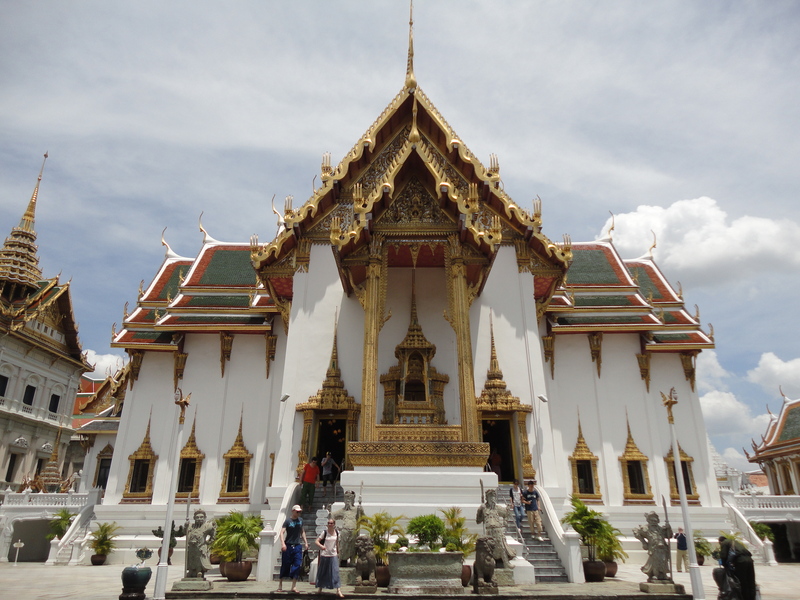 The temple has very beautiful buildings as well, with fine towering domes and spires and exquisite figures and wall decor, as well as the massive gold stupa that can be seen from outside. 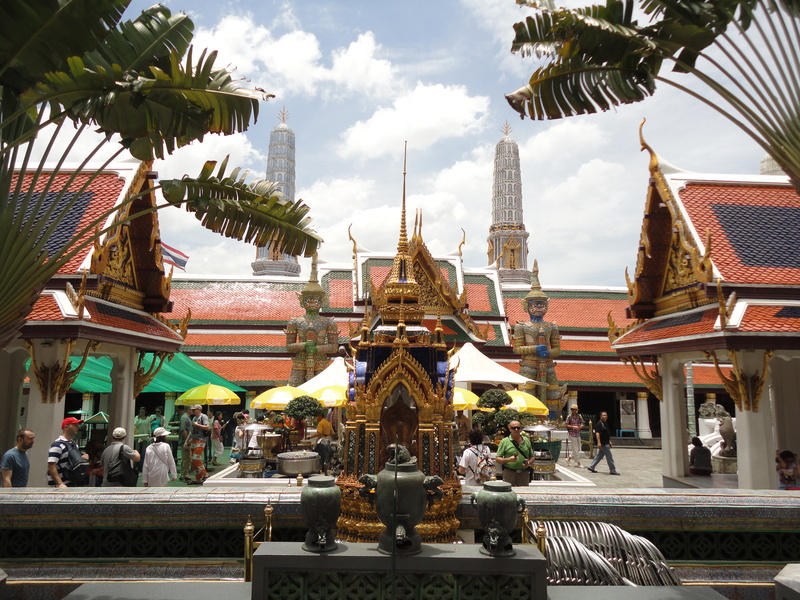 Though inside the palace complex, the Temple of the Emerald Buddha is separated from the other palace buildings so you only enter the palace proper after leaving the temple. 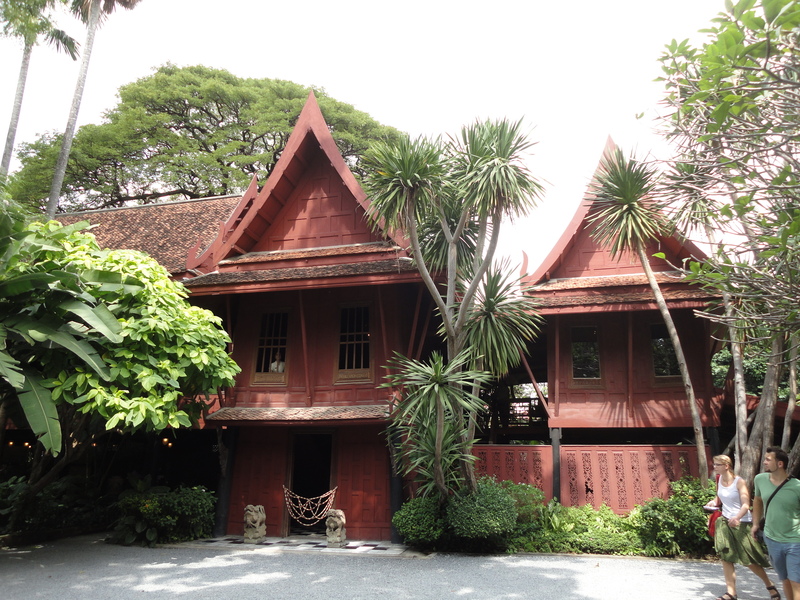 There are a lot of traditional Thai-style buildings, pavilions and shrines, as well as a large outdoor model of Cambodia’s Angkor Wat, which was occupied by Thailand for a time in the past (this sense of ownership from the Thais over such a famous historical site that is clearly another country’s shocked me a little). 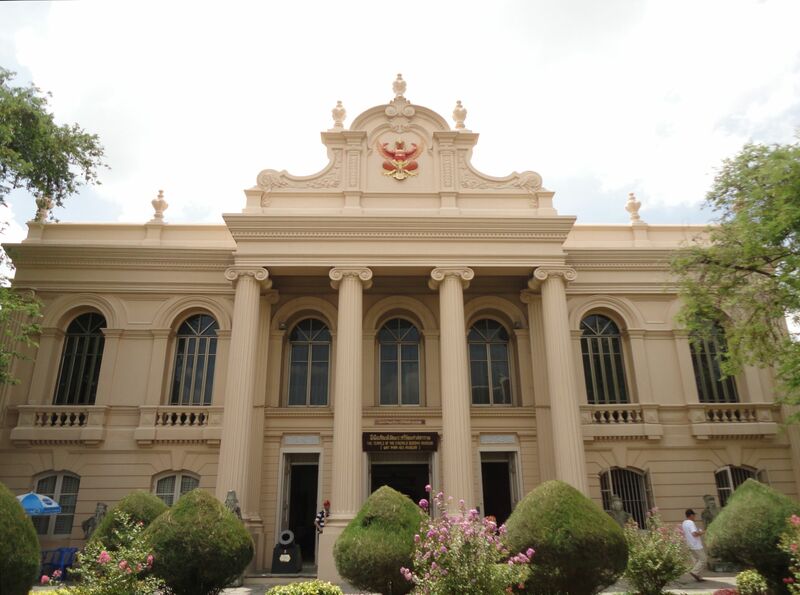 The palace was built in the late 18th century but there are also some European-style buildings that were constructed during the 19th century and later. 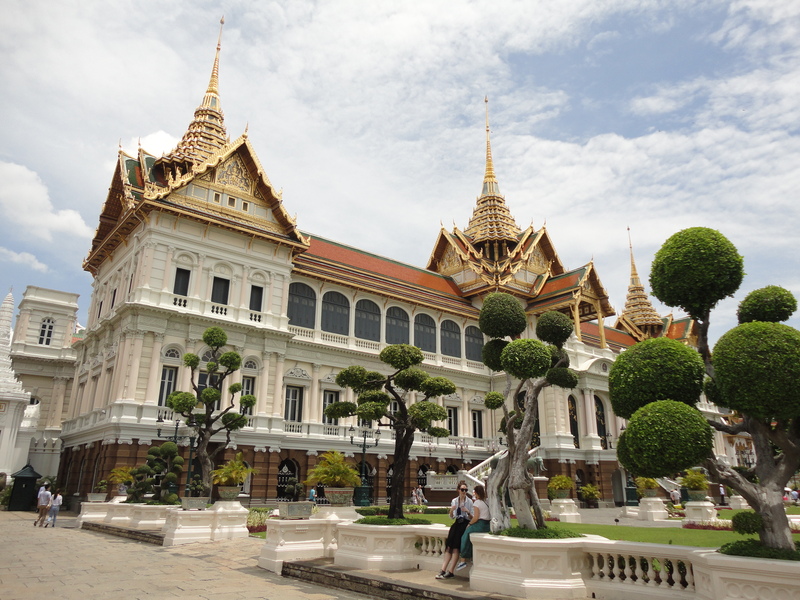 The centerpiece of the complex is the Chakri Maha Prasat, a large stately hall that combines a European facade with Thai-style roofs. Besides the fact it looks impressive (see the photo at the top of this post), it was surprising to come upon such a large European-style structure, which kind of gives off the effect of suddenly being somewhere in Europe. The open space and landscaped garden in front of it adds to the feeling. As magnificent as it is, it’s too bad tourists cannot go inside. 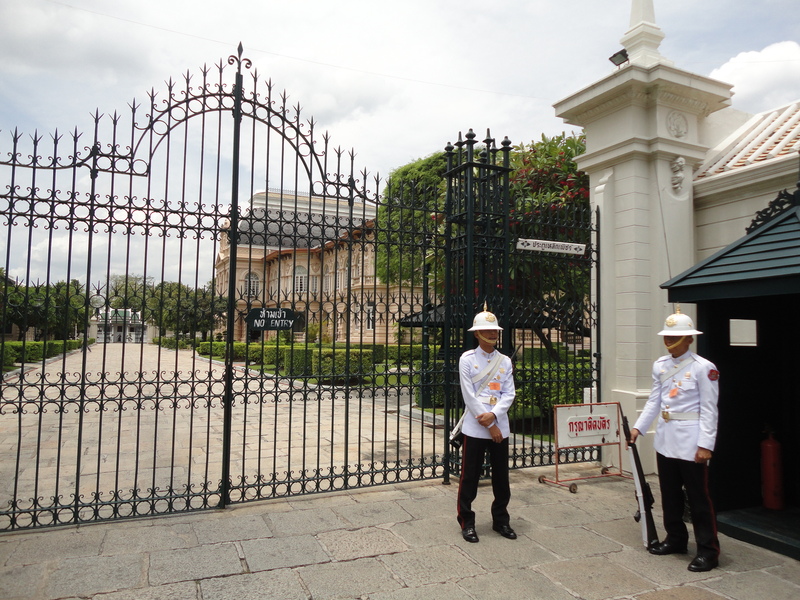 The place is walled off and guarded by stern sentries. 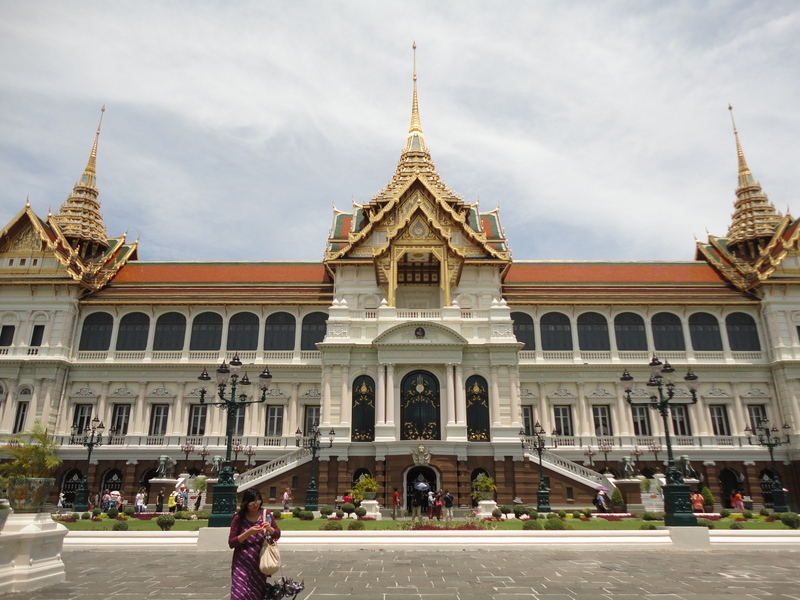 As the royal family doesn’t actually live here anymore (they moved out in 1925 to another palace in Bangkok), the Grand Palace is actually a symbolic site that may sometimes receive foreign dignitaries. This is one touristy place that is definitely worth enduring the crowds for. 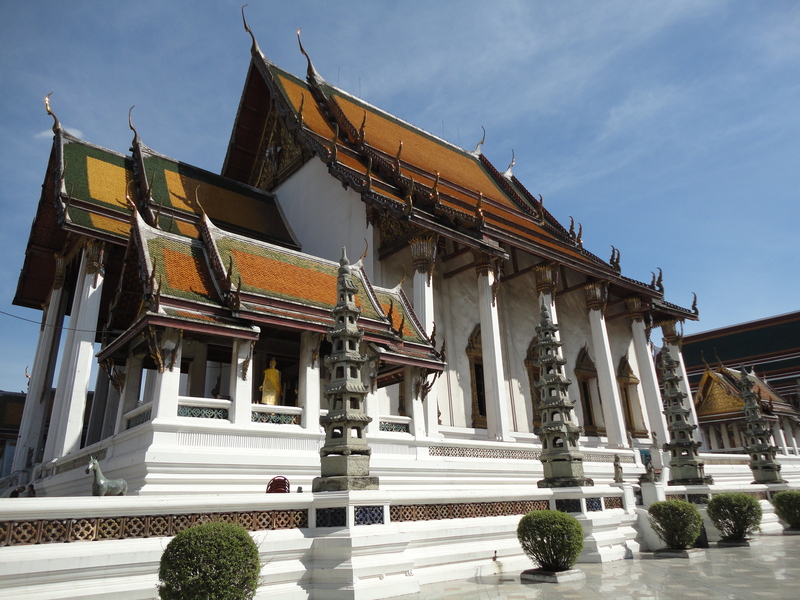 The palace is located near the Chao Phraya riverbank and across from Wat Pho. 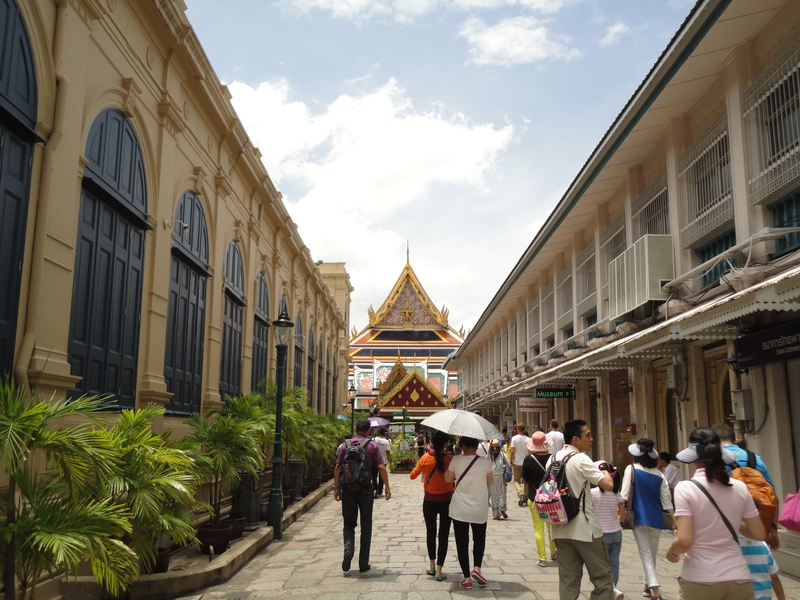 After leaving the Grand Palace, I took a river-taxi, then transferred to a subway and to a mall, my one and only mall visit in Southeast Asia. Later that evening, I went to check out one of the city’s “notorious” areas which was indeed eye-opening (though not the extreme kind). 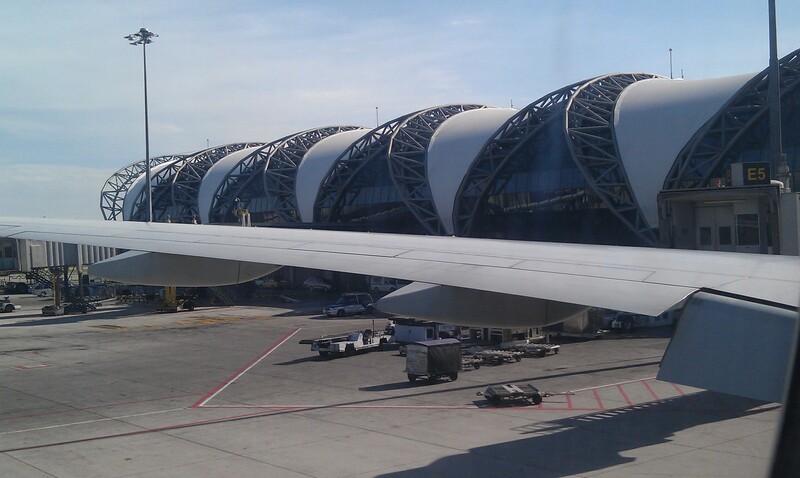 And that was it for me in Thailand and Southeast Asia as I left the next day to go back to Taiwan. 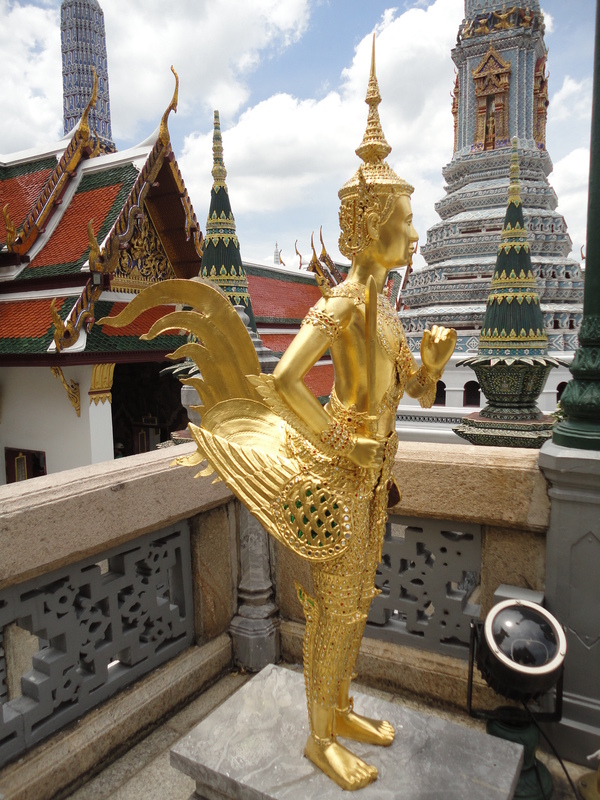 A kinnara, half-bird, half man figures who are lovers and musicians and are featured in both Buddhism and Hindu mythology. I’d seen this in Cambodia as well. 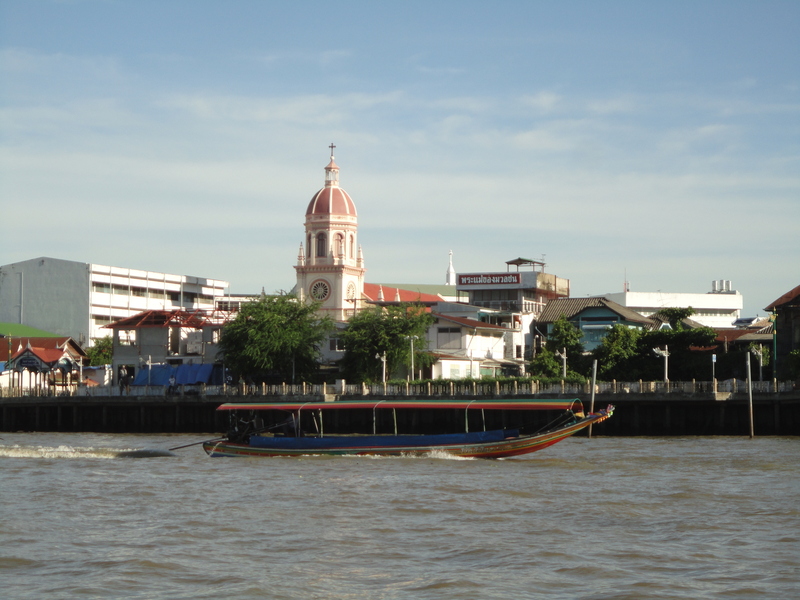 Bangkok’s Chao Phraya river curves along the city, bisecting the old western part Thonburi from the more populated and bustling eastern part. 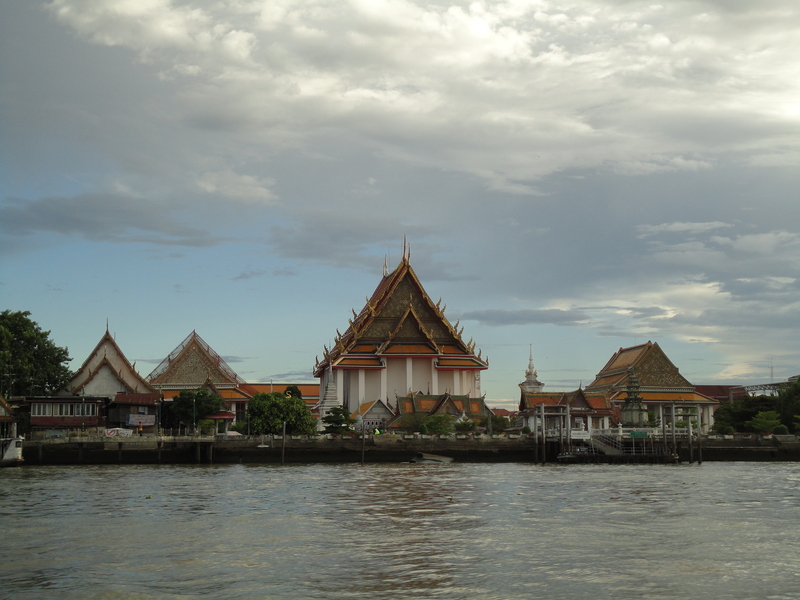 The Chao Phraya is more than a pretty sight as it is a marine motorway that allows travelers to get to several places like the Grand Palace and Wat Arun easily. 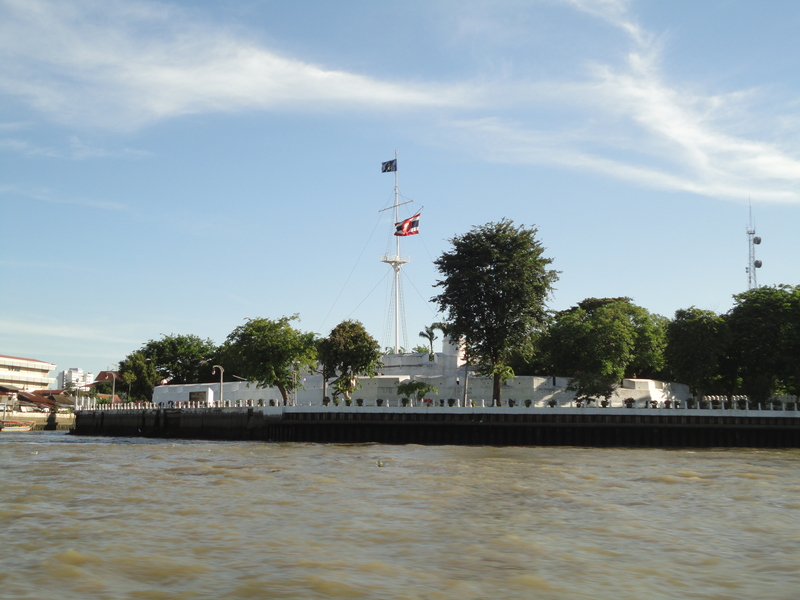 Boat ferries run along the river regularly, plying five routes from the morning to the late evening. Several of the piers are just a short walk from subway stations. 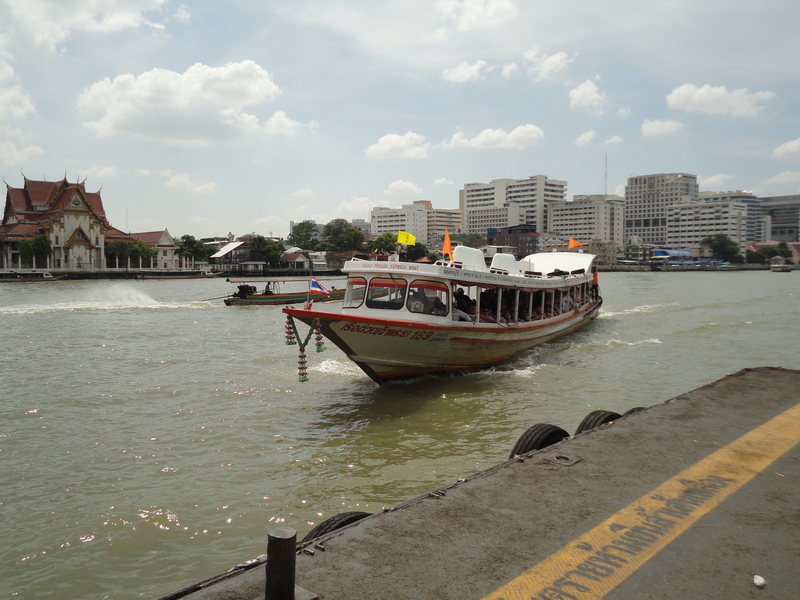 For me, it was the easiest way to get to the Grand Palace, Wat Pho and Khao San Road so I took the ferry every day I was there, which was a pleasant experience. 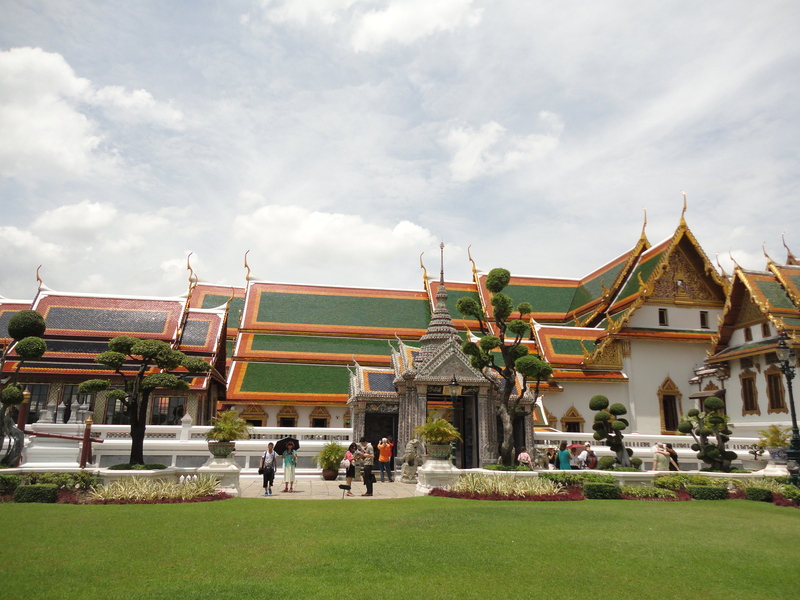 You get to see fantastic views of Bangkok including modern skyscrapers and hotels and old temples and forts. Along the way, there are smaller canals that link to the river and ferries run on those as well. 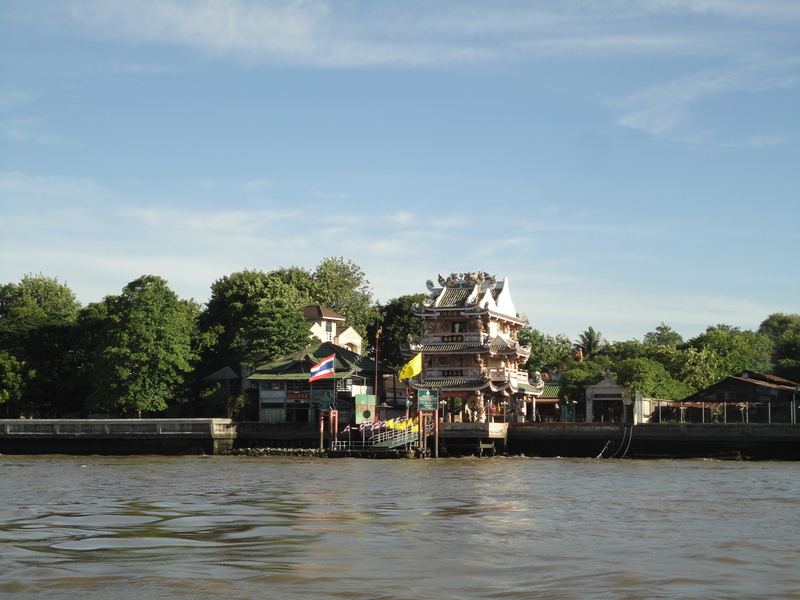 The river fort above is near the Phra Arthit ferry pier, which is close to Khao San Road. 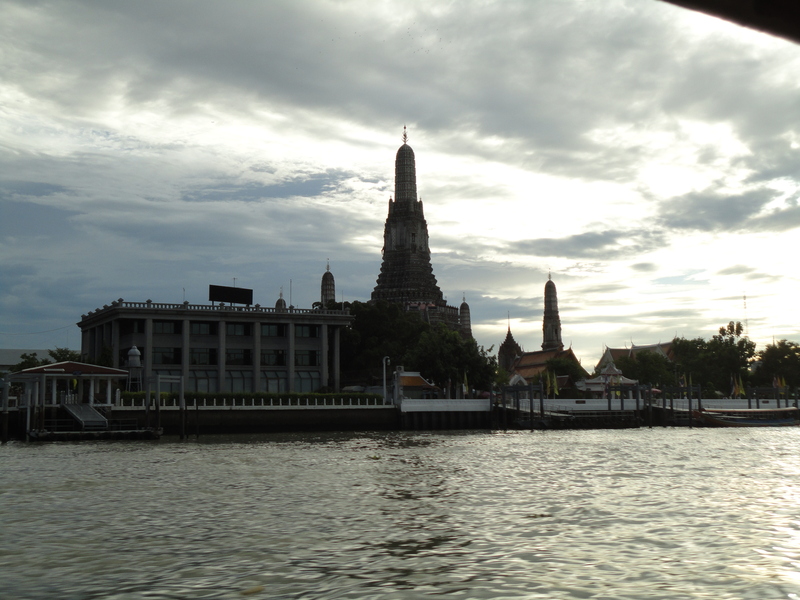 The most stately sight is Wat Arun, a large domed temple prominently situated right by the riverside on the opposite side of Wat Pho (a few minutes from Tha Tien pier). I passed it by several times but unfortunately I didn’t actually visit it since I was short of time. 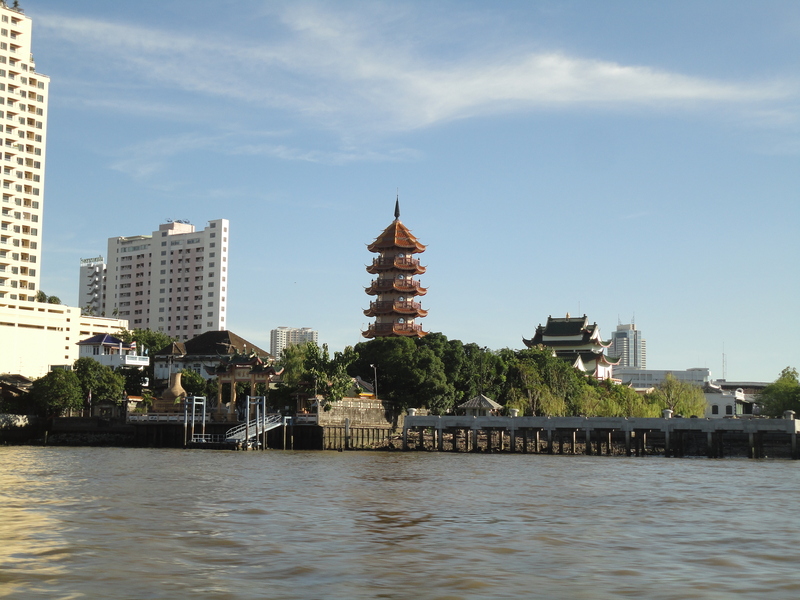 Elegant historic buildings line the river, from river forts to European-styled churches to Chinese temples and pagodas. 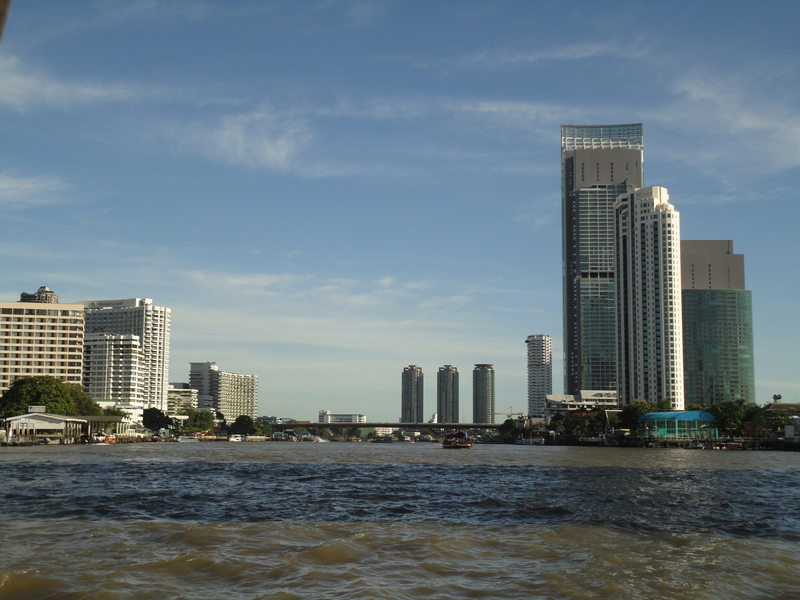 Modern skyscrapers line part of the river’s banks, reminding you that Bangkok is a modern metropolis. For some reason, the sight of tall towers lining a river reminds me of Miami. Besides tourism, the river is also a transportation route, as these mighty cargo barges, above and below, attest. 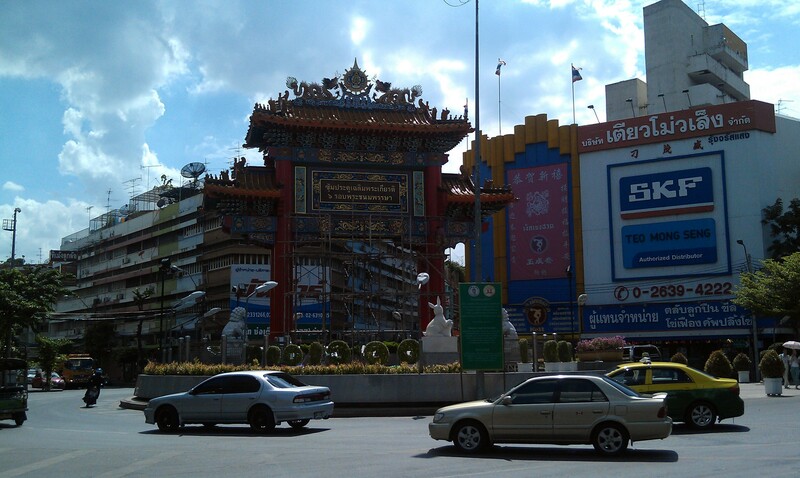 Hostel by Khao San Road- I’m not sure if that is just a temple facade or a real temple at the side of that building. 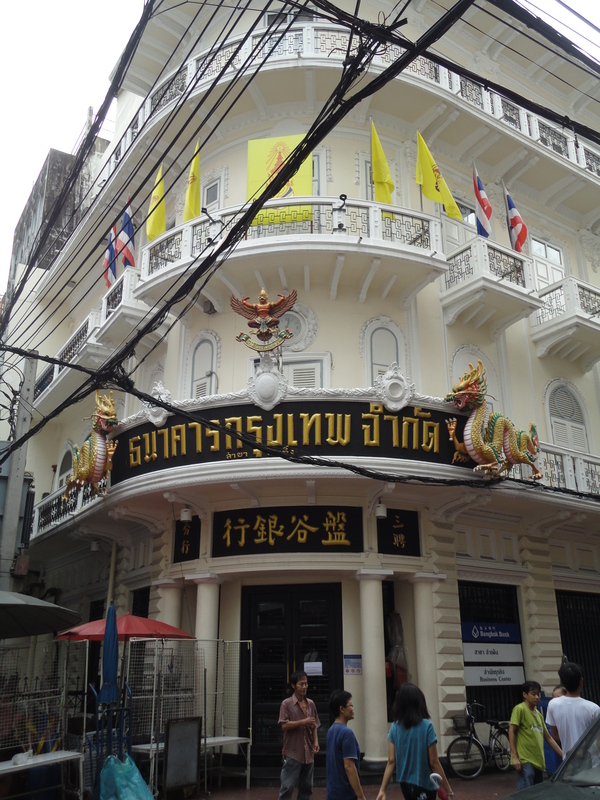 Bangkok has a historic Chinatown in a district called Yaowarat where Chinese immigrants have lived since the late 18th century. 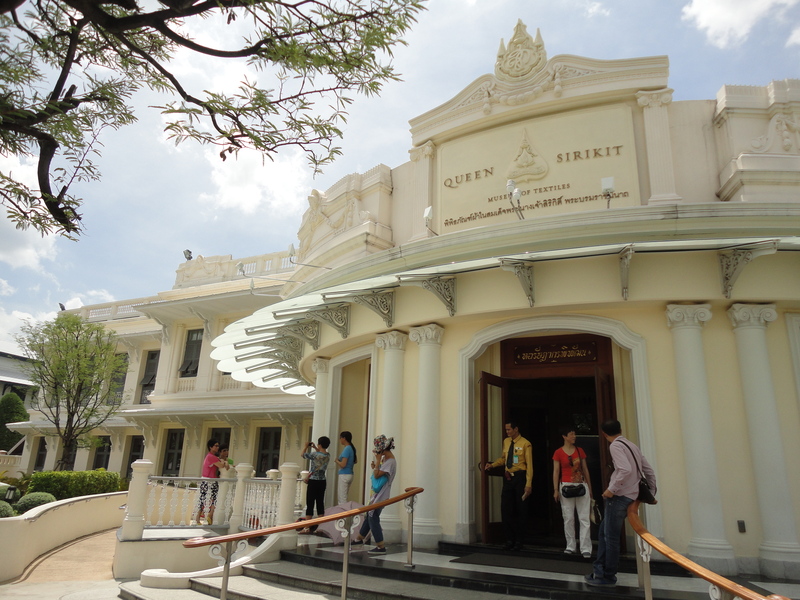 There’s also a “Little India” nearby. However I may have picked the wrong day to visit, since when I went on Sunday, many of the shops were closed and the neighborhood was very quiet. 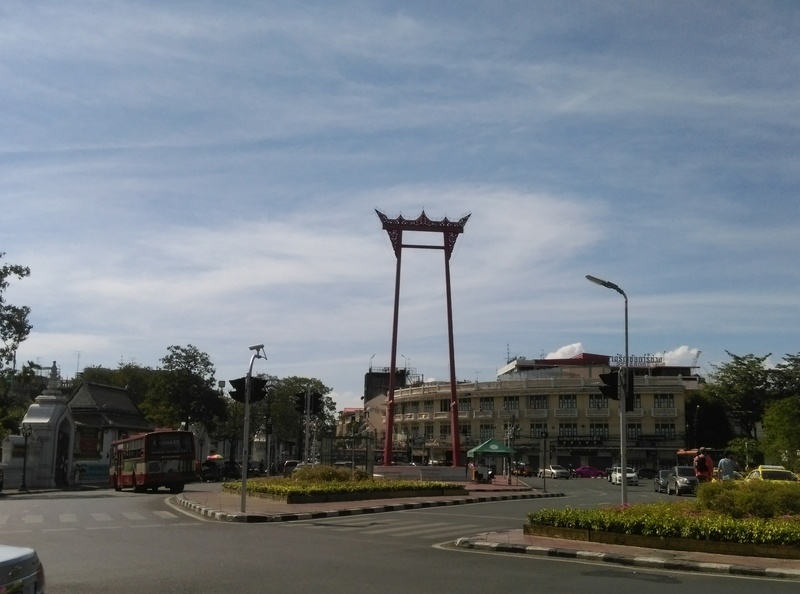 As with the “Chinatown” in Saigon/Ho Chi Minh City, the Chinese influence isn’t that physically apparent, but rather understated. There are many gold shops, that being something a lot of Chinese and Indians like, and restaurants, but a lot of the area is a bit rundown. 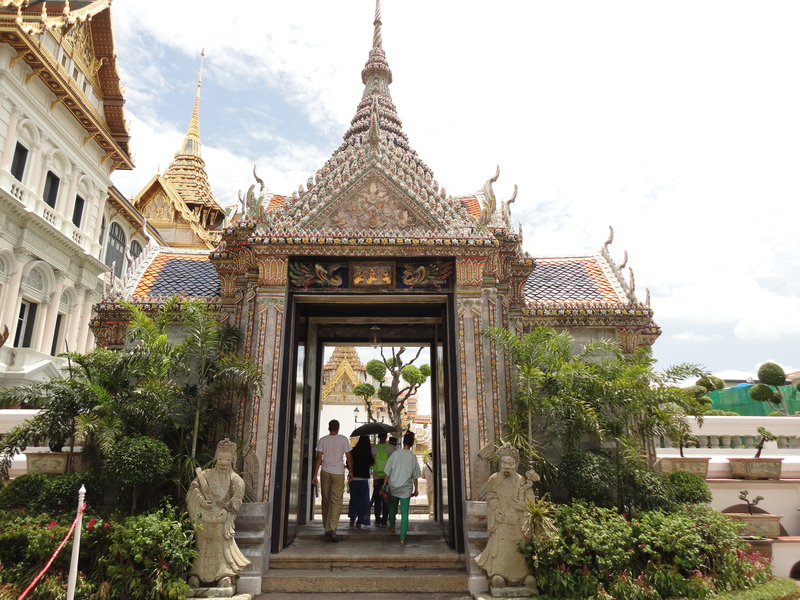 While we missed out on experiencing the bustling character of the area, the highlight was several unique temples. While none of them were Chinese, it was unique to see such temples within such a dense urban neighborhood. 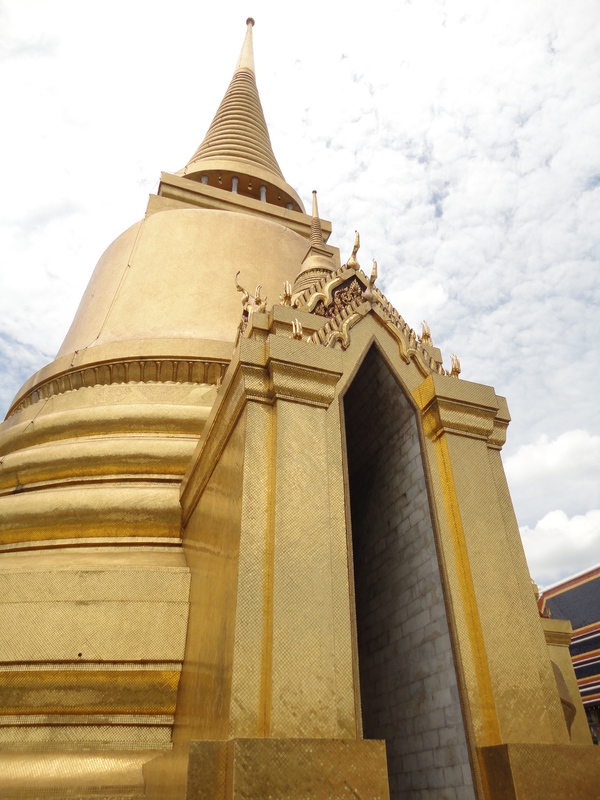 Wat Traimit features the world’s largest seated Buddha at 5 meters. 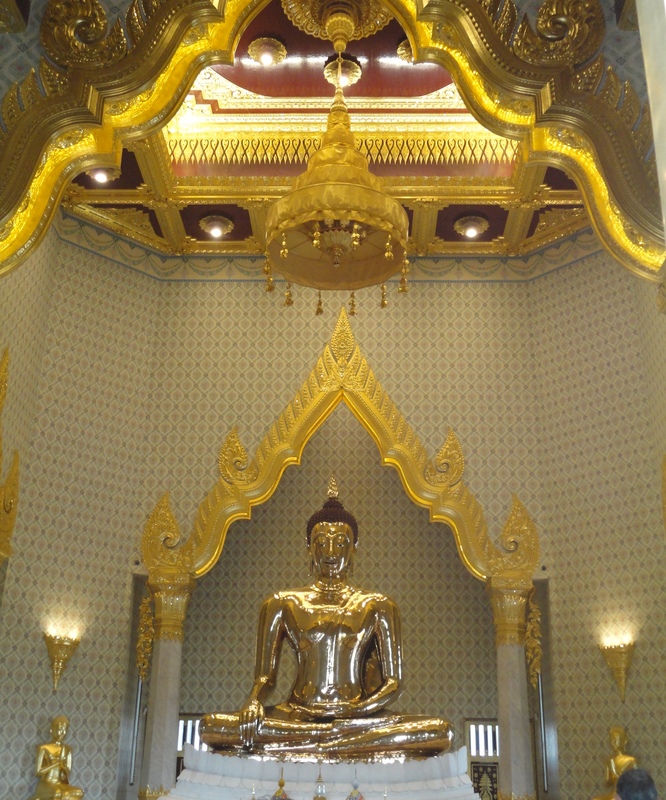 The Buddha sits in a hall on the top level of an impressive gold-topped building that also features a small museum about Yaowarat’s Chinatown and the Chinese immigration on the lower levels. 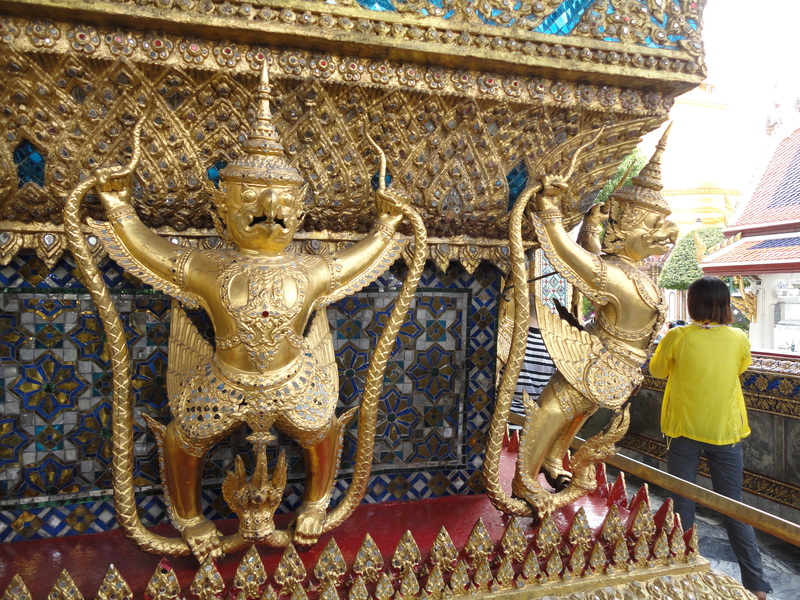 Wat Samphanthawongsaram Worawiharn was another nice temple, despite its long unwieldy name. 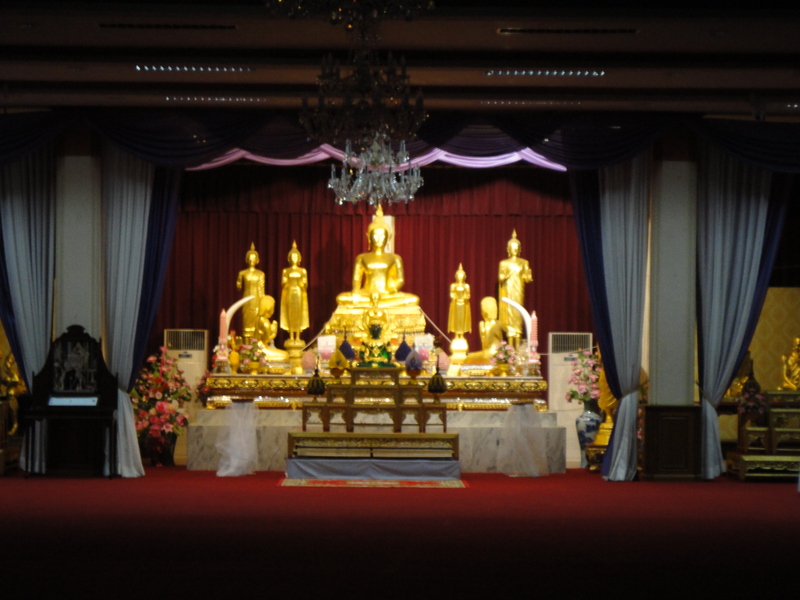 A “third grade royal temple” that was granted royal status in 1795, it features a main hall with several golden Buddha statues, a teak house and a few small pavilions. We then walked through an enclosed market lane wedged between buildings. There were many stalls and shops in the lane, though the market looked as if it was still getting ready for the night. 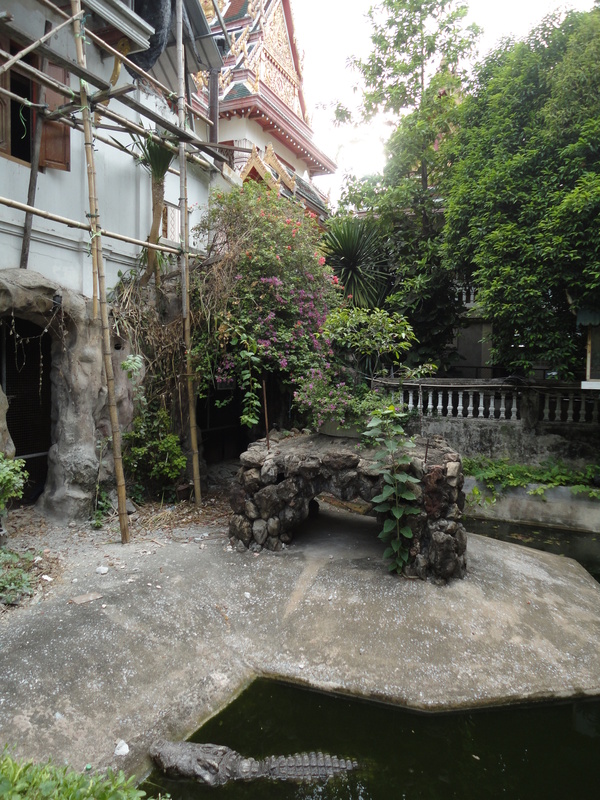 While doing a little bit of research online, I’d heard of a temple with crocodiles inside. 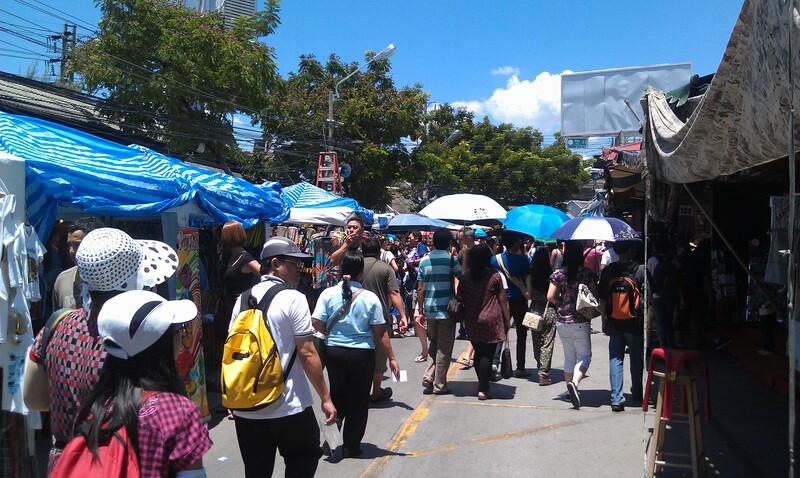 After going to Wat Traimit and Wat Worawaiharn, then walking through the market, we neared the river. I feared we’d miss the crocodile temple but then I saw a temple to the side. As we walked to it, a guy saw us and said “crocodile!” so that was that. Wat Chakkawat Rachawat was a tree-lined complex with a large hall with a Buddha. It also has crocodiles – several of them, with one being very massive. You can see it below but the photo doesn’t do it any justice. Besides the crocodiles, the temple features several distinctive domed stupas and buildings with different styles. 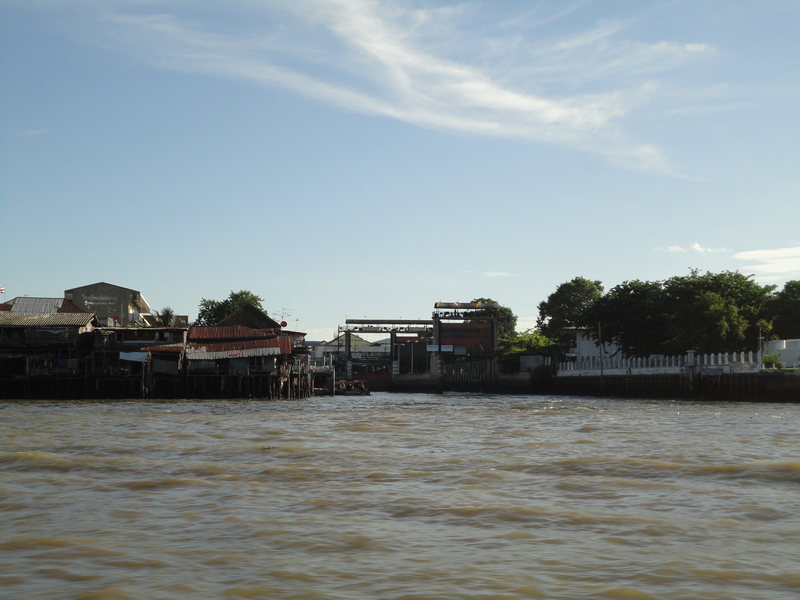 We then left Yaowarat by boat on the Chrao Praya river for Khao San Road where my friend and the other people were staying. 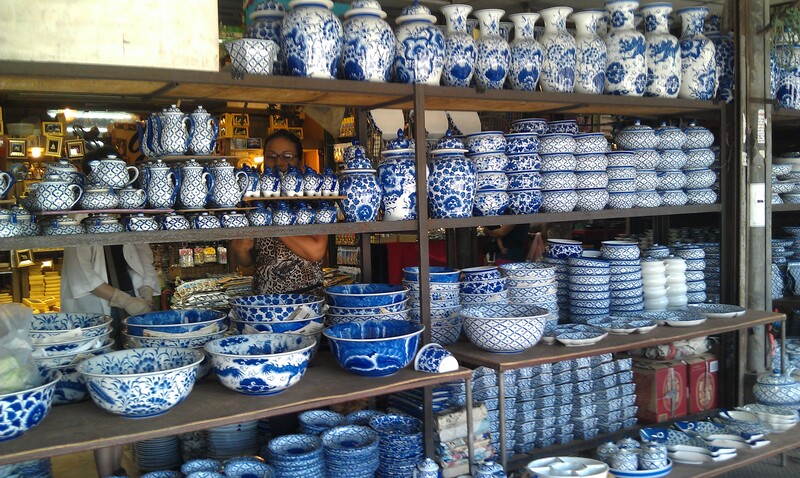 Earlier that day, I had met up with my friend, one of the mainlanders I’d met back in HCMC, in Chatuchak Market. It’s a large market that sells everything from clothes to souvenirs to food and even weapons which you’ll see in the photos below. 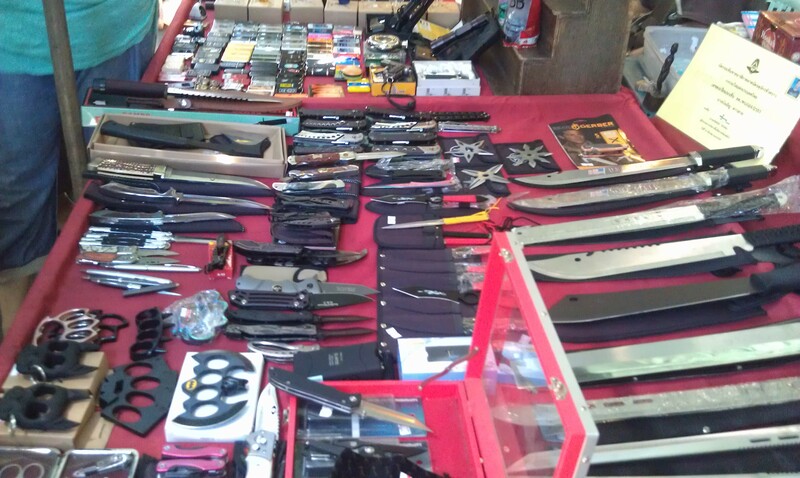 That weapons stall was filled with knives, cutlasses, brass knuckles, ninja stars and even a taser which worked. 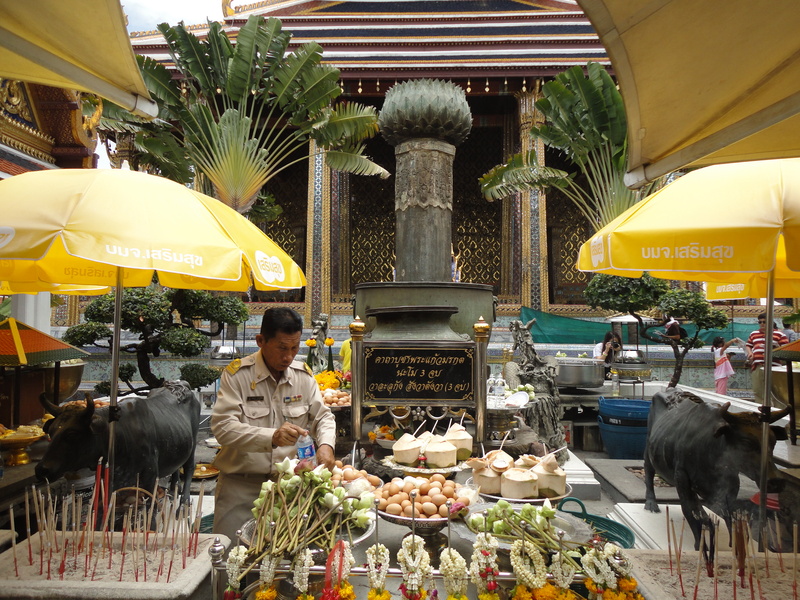 It shows how relaxed Bangkok is that one can sell so many deadly implements in full view. The vendor allowed us to hold them and pose, as well as use the taser (though not on a person of course). The market is big and consists of several sections that sell different things. One can easily get lost in it. Actually, I’d arrived early and at the scheduled exit, I saw my friend walking towards me with a security guard who had led him to the location. We walked around and then bumped into the other mainlanders who my friend was staying with. They had all come over together from Cambodia. Yes, these are all real. Most of the neighborhood was laidback like this. 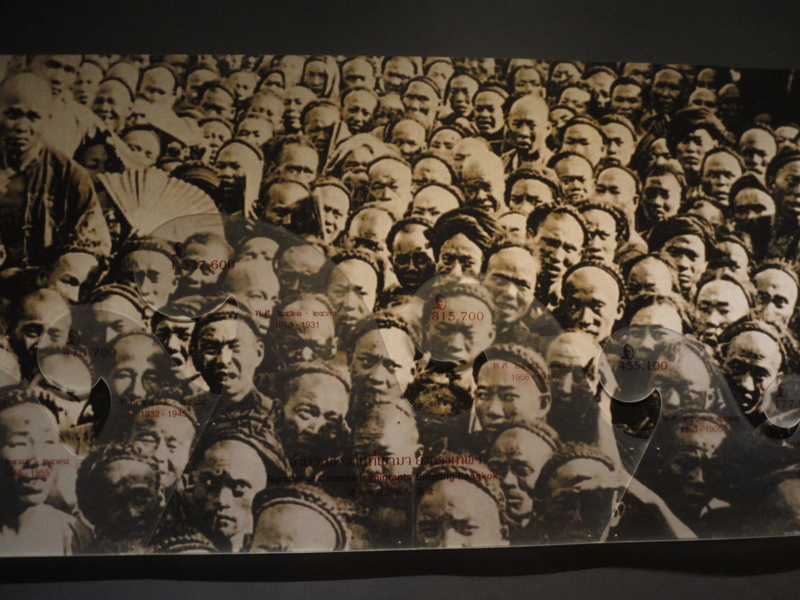 Chinese arriving in Bangkok in the 19th century, in a photo displayed in the mini musuem inside Wat Traimit.